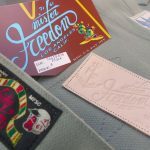 Mister Freedom® “CALIFORNIAN” Lot.674, Selvedge Pique Edition, mfsc SS2019 Sportsman catalog, Made in USA. 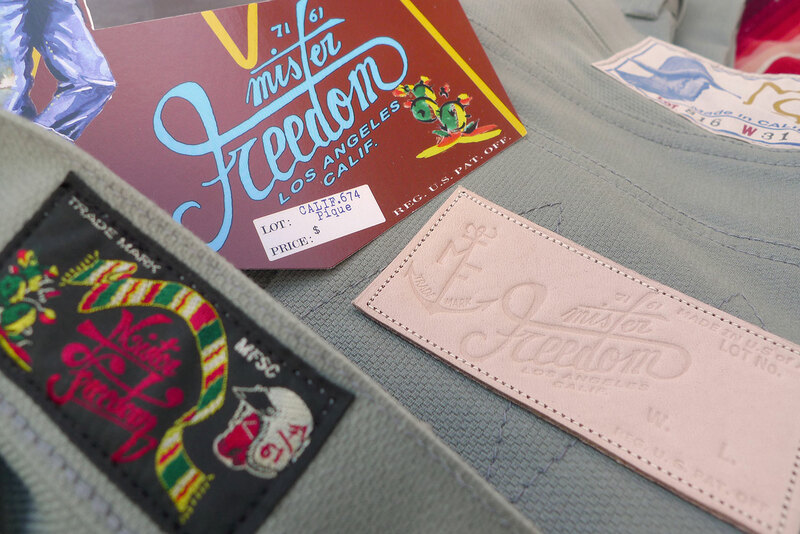 Mister Freedom® “CALIFORNIAN” Lot.674, Selvedge Piqué Edition. 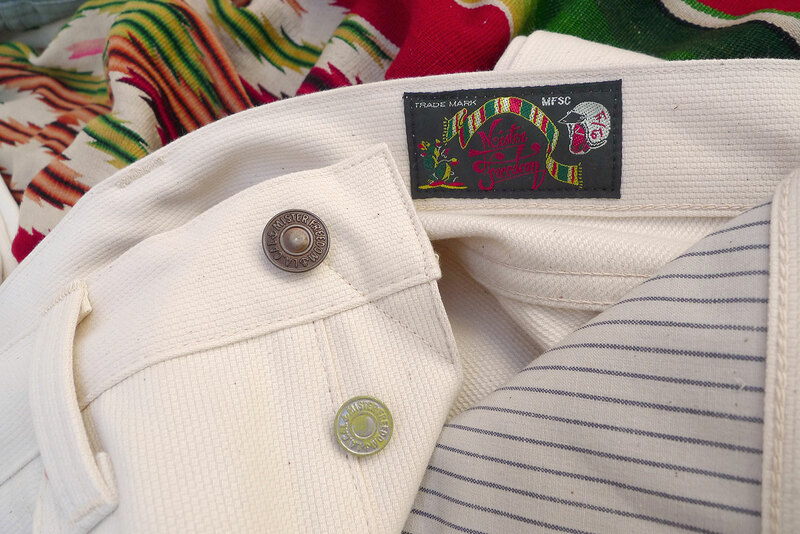 Our theme-based capsule collection for Spring/Summer 2019 is called “YUCATÁN”. 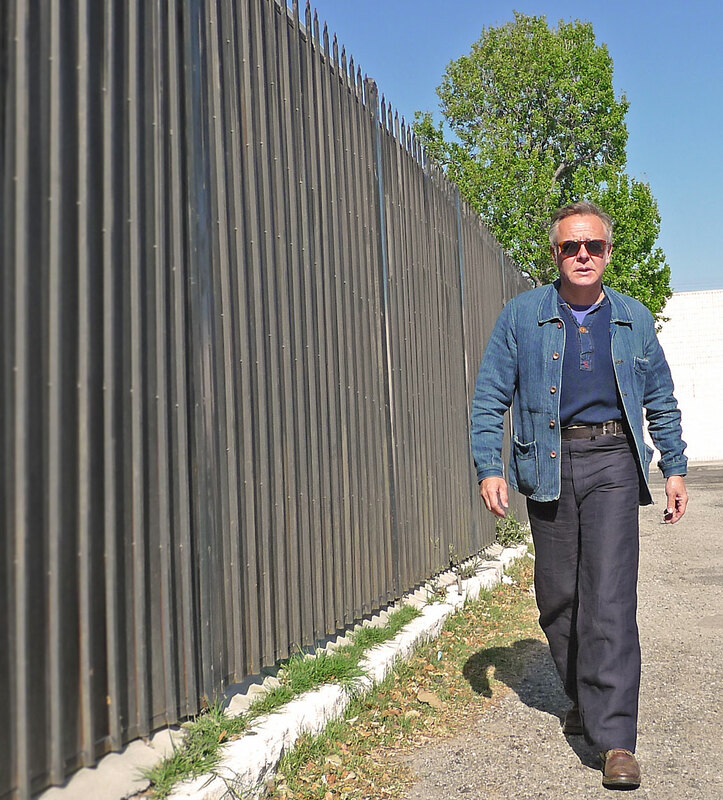 Not just a straightforward allusion to the famous Mexican peninsula and State notorious for the Mayan ruins and beach resorts, but a reference to the lesser-known tittle of an unreleased movie project famed actor Steve McQueen worked on in the late 1960’s. 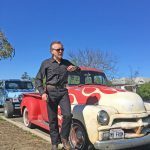 The unfinished but thoroughly-researched project sat in a basement until one fine day of 1996, when Chad McQueen allegedly dusted off two old leather trunks… packed with leather binders containing a 1,700 page-long scripted storyboard! Having personally crafted the story, Steve McQueen had carved a perfect role for himself. 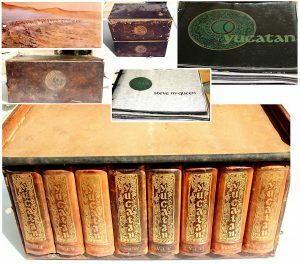 “Yucatán” recounted the action-packed tropical adventures of a former US Navy diver turned treasure hunter in Southeast Mexico. Motorcycle chases in the desert, ruthless archeological site looters, dune buggy racing, scuba diving in cenotes… Good stuff! 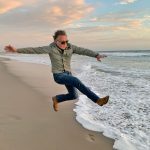 Somewhat of the ultimate wild ride from the Gulf of Mexico to the Caribbean Sea, an “Indiana Jones” type saga, with Mayan culture as the backdrop, and the cooler king as the rider. Unfortunately for action-movie fans, the project was eventually abandoned, after “Le Mans” almost ruined McQueen’s Solar Production company. 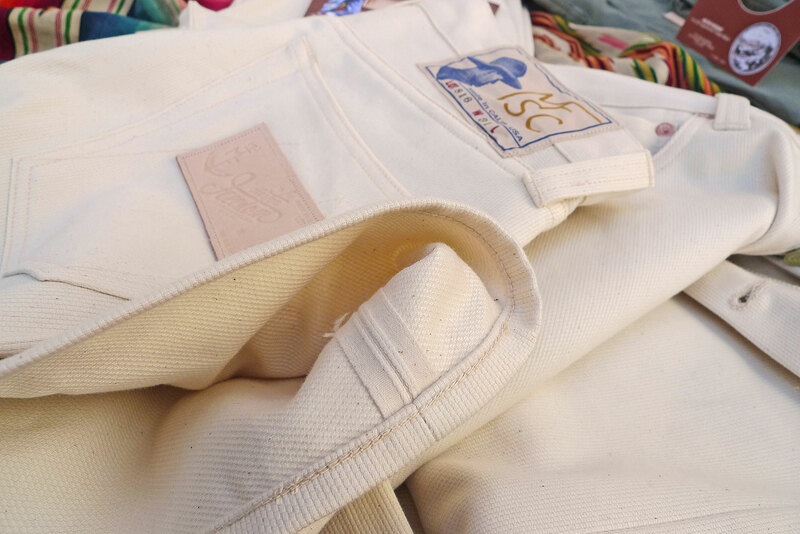 The ‘treasure’ trunks containing the storyboard ended-up in an auction in Santa Monica, CA, in 2013. Surprisingly, no takers. “Yucatán” is today property of Warner Bros, and it has been reported that Hollywood star Robert Downey Jr. (and his Team Downey) have been hard at work trying to turn the original McQueen’s story into a silver screen blockbuster. 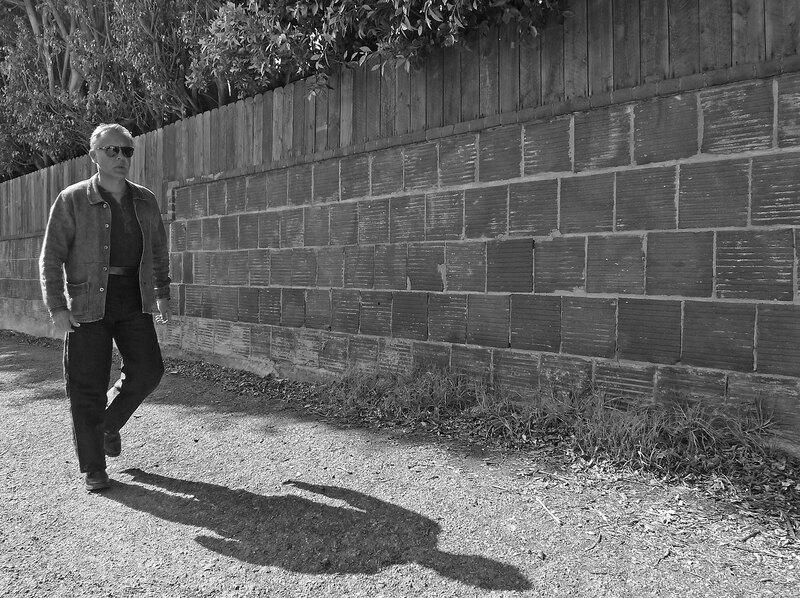 As of 2015, the promising project was still at the developing stage… Considering Mr. Downey’s talent, I am personally quite looking forward to the film release, if this ‘lost classic’ ever materializes. More on that story here and here. 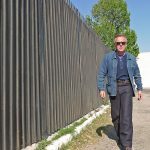 Official updates on the movie project here. Back to our line of work, the schmata. 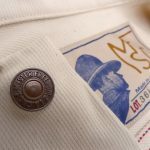 Drawing inspiration from a movie you have yet to see might sound a bit challenging, but this is actually quite along the lines of our “might-have-been” design approach that keeps us clear of straight-up replicas and repetitive work. 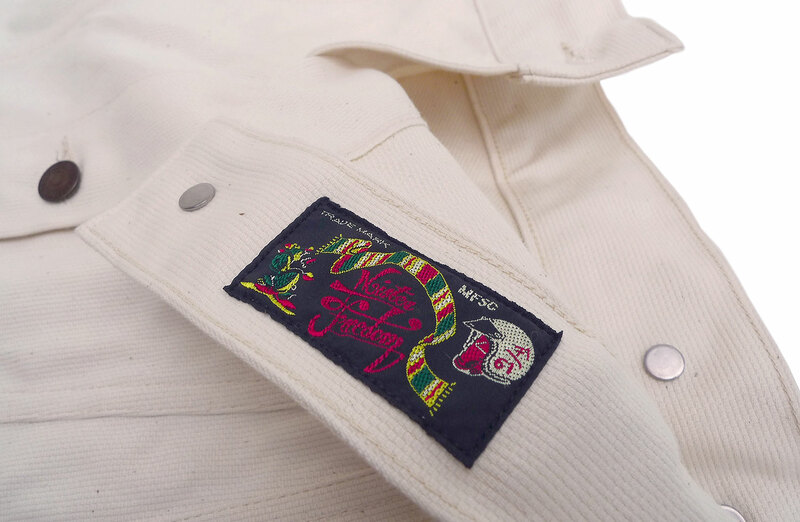 The vibe of our SS2019 “YUCATÁN” fashion venture is sporty, racy, with a touch of beachcomber meets desert rat, all that with a subtle sixties treatment for grown-ups. 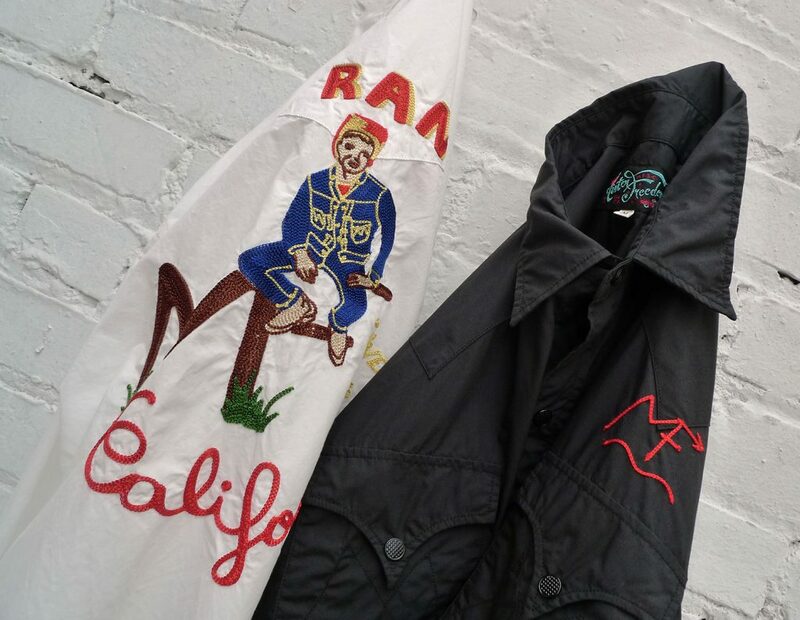 This concise, full-throttle yet unassuming collection includes the DUNE BUGGY Jacket, the MARINA Polo, the “Yucatán” Rock’n’Roll Fiesta Shirt, and is complimented by two Sportsman catalog pieces, the COWBOY Jacket and CALIFORNIAN Lot.674 in Piqué. 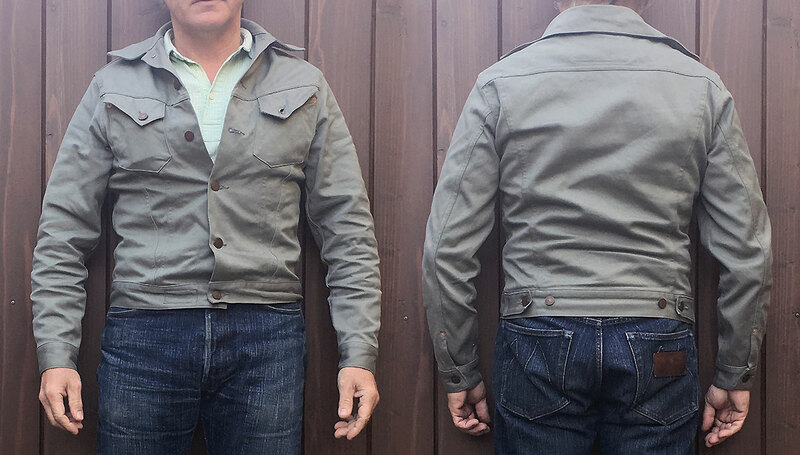 If the Piqué Cowboy Jacket landed early in the season, its bottom-half Lot.674 companion is just fresh-off the small and busy SoCal factory that proudly and painstakingly produces a large portion of the Mister Freedom® mfsc Sportsman catalog, and all of the Californian family jeans and jackets. 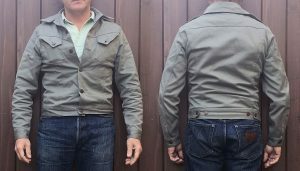 As far as style, piqué jeans with matching jackets became popular with young adults in the early 1960’s, as a casual alternative to blue denim, with Levi’s® leading the trend with its 911 series released in a palette of subtle earth tone colors. 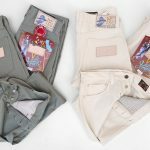 “Color jeans” in general, of assorted woven patterns and from several makers, made their way to American campuses, city streets and film sets. 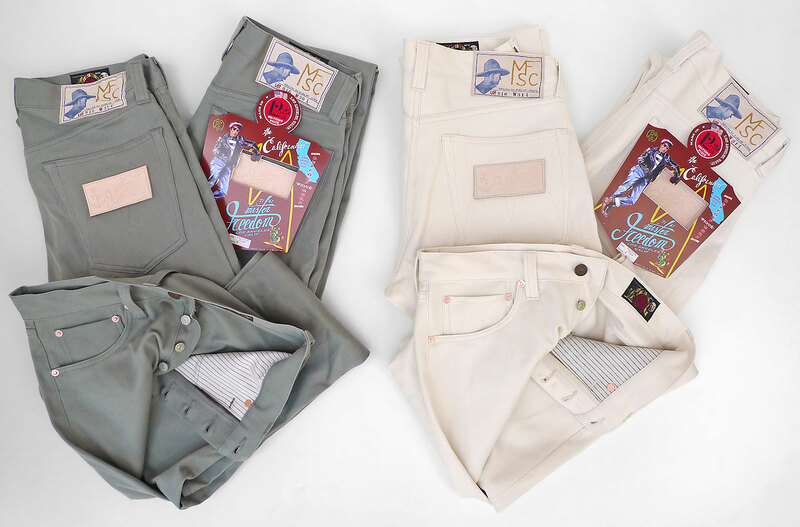 Lee Riders® was popular for its sateen “Westerner” models, Levi’s® for its pique and twills, and Wrangler® for its twill and light blue denim versions. 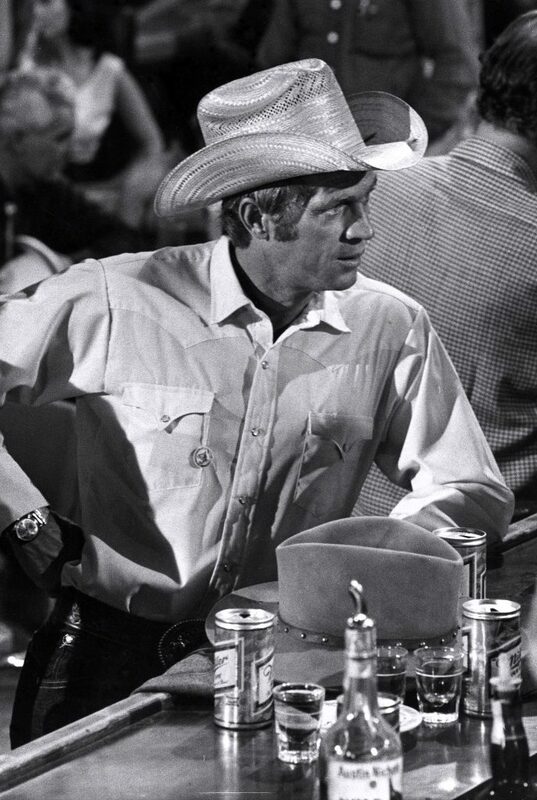 Style icons like Steve McQueen or Paul Newman adopted their own favorites on and off screen, unwillingly promoting the style, contributing to its cool easygoing sixties fashion vibe today. 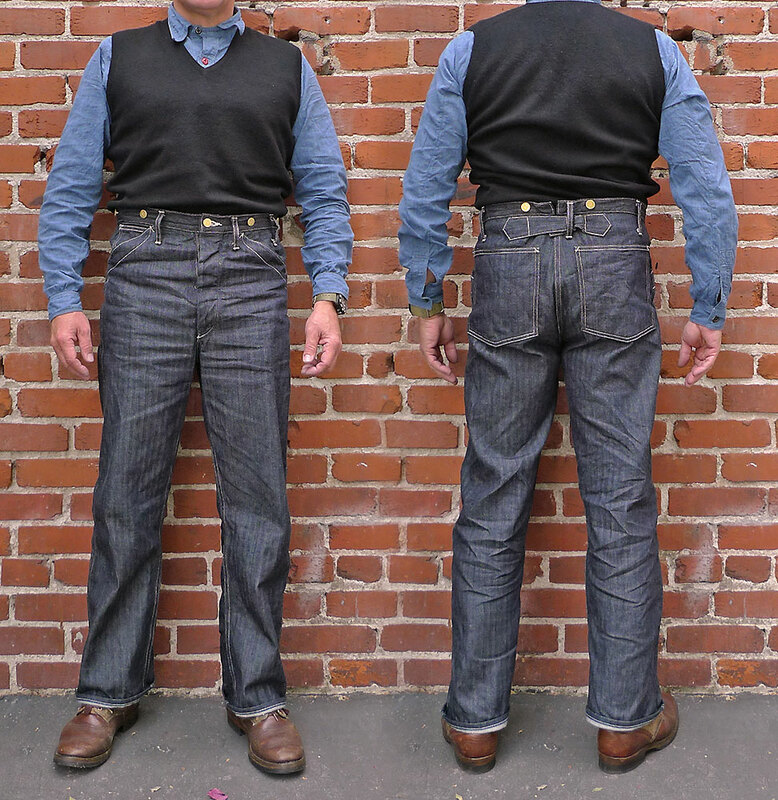 We introduced our Californian Lot.674 pattern back in 2017, featuring the top block of the Lot.64 combined with tapered leg of the Lot.74, and a button fly. 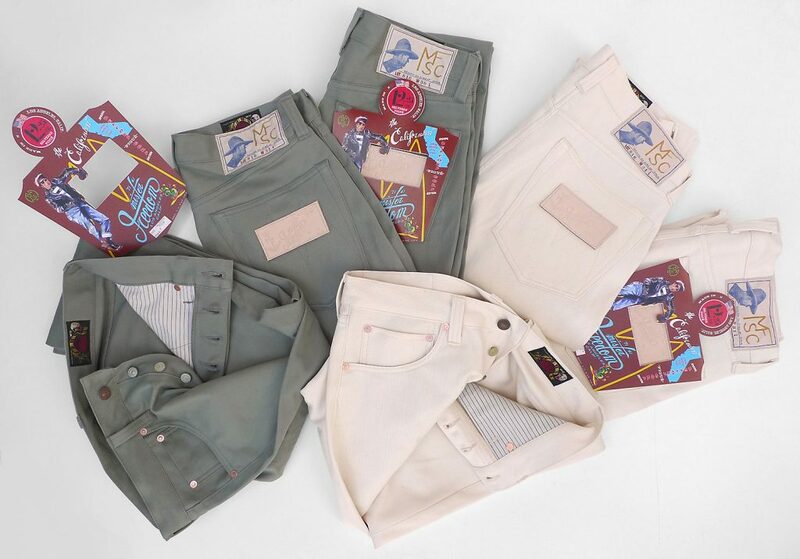 The Lot.674 is our slimmest leg, although not by contemporary fashion standards that have raised the “slim fit” bar to breathtaking (literally) levels, but according to our own classic menswear aesthetics. Refer to this timeline for a summary of the Mister Freedom® five-pocket jeans fits and various fabric releases. 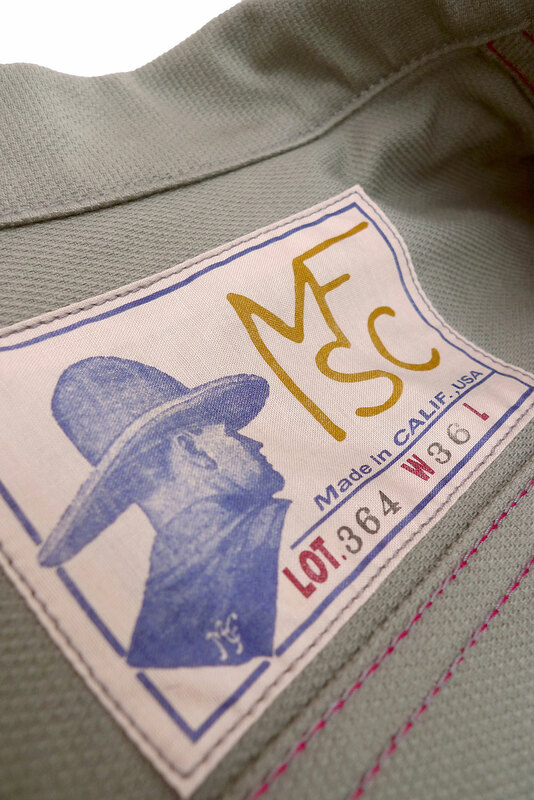 The mfsc CALIFORNIAN Piqué Edition is designed in California by Mister Freedom® and manufactured in the USA in collaboration with Sugar Cane Co.
Pocket bags: Fancy NOS woven stripe canvas, 100% cotton. 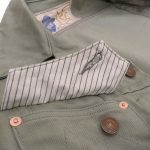 * NOS fabric pocket bags, fancy woven striped cotton canvas. 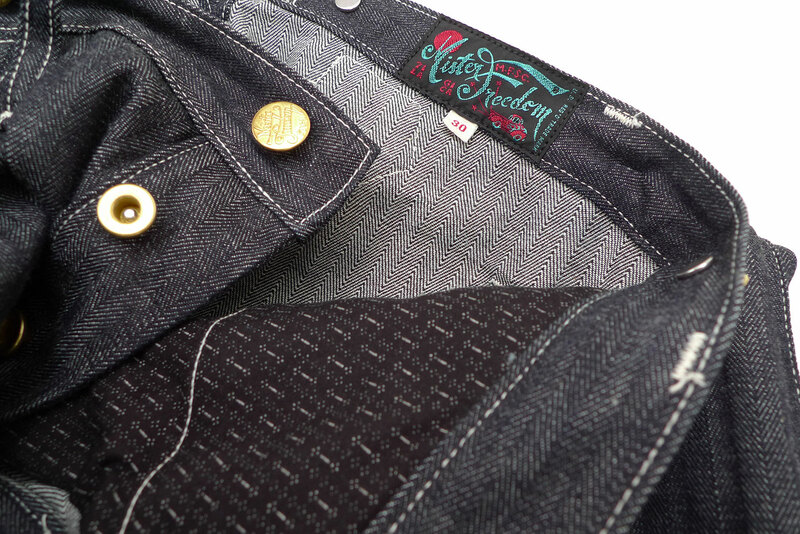 * MF® original tonal “M” stitch arcuate design on rear pockets. 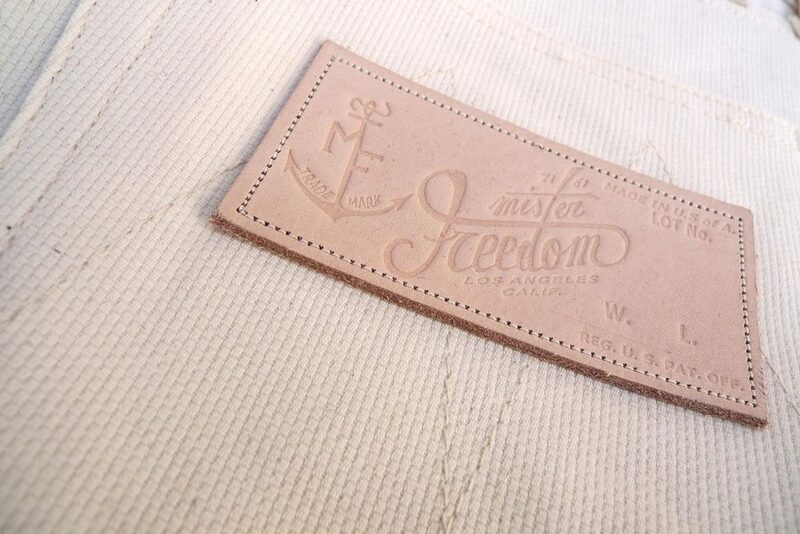 * Debossed natural veg-tan cowhide leather MF® patch on rear pocket. Will tan an age nicely overtime. 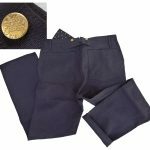 * 100% cotton thread tonal construction, combining several gauge of thread. 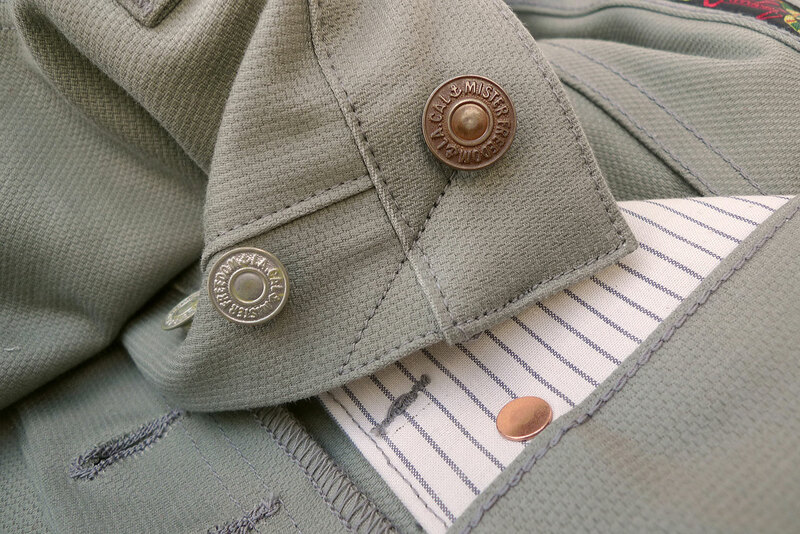 * Combination of silver-color ‘oxidized’ MF® metal cast fly buttons, and MF® brass tack waist button. 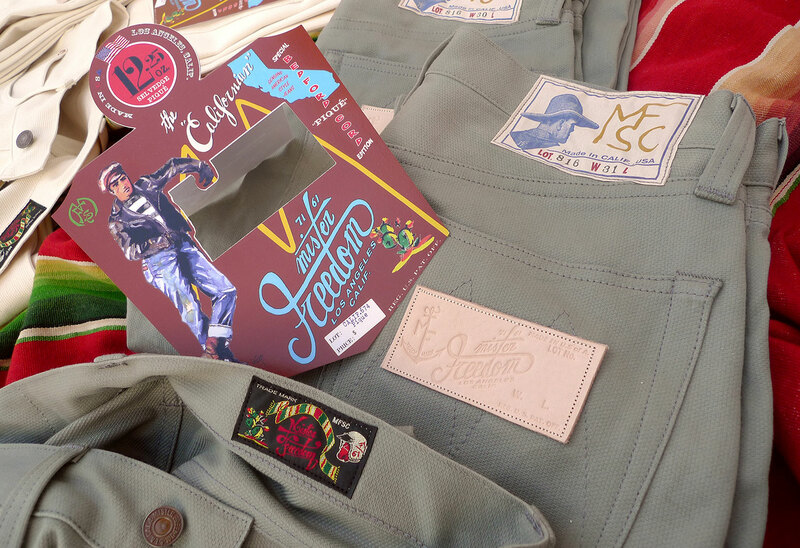 * Original MF® paper pocket flasher (chocolate brown). 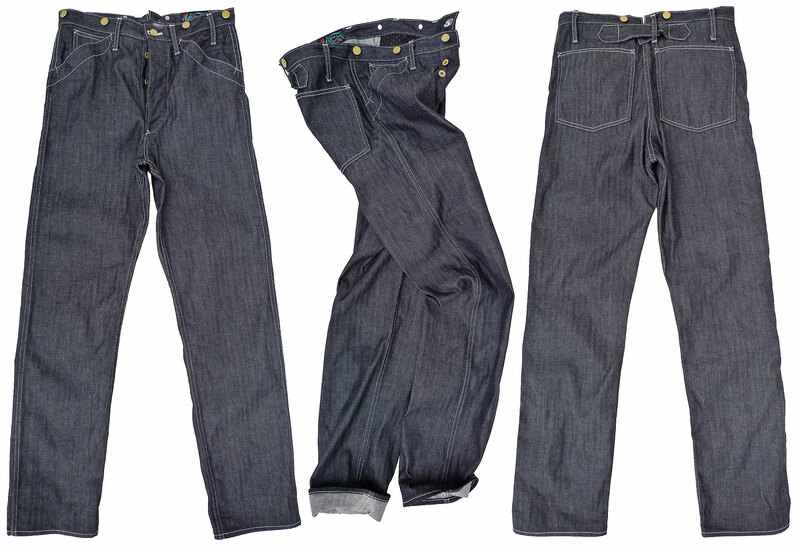 The Piqué CALIFORNIAN Lot.674 comes UN-WASHED (i.e. raw/loomstate) and is cut so that the measurements match the labeling after an initial cold soak/line dry. 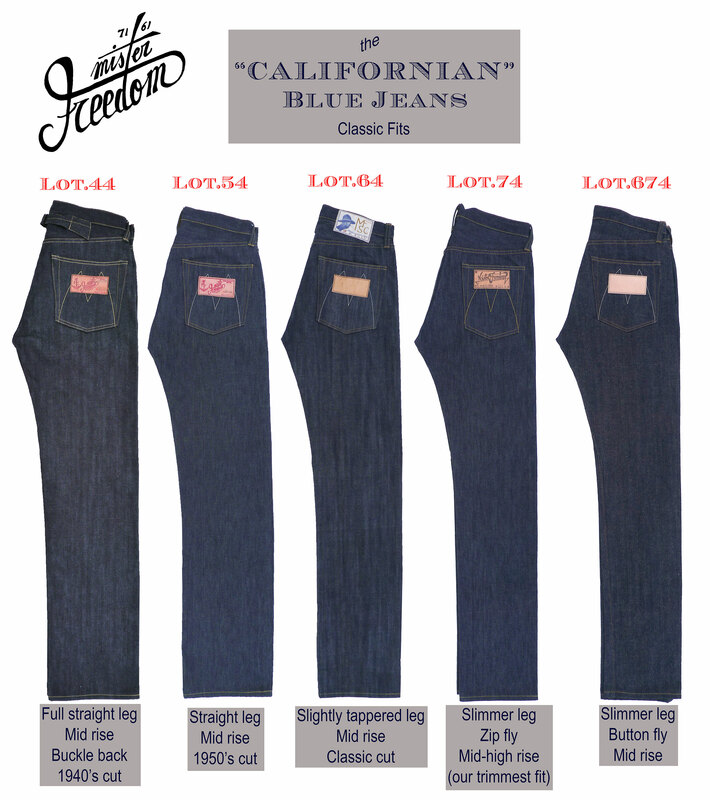 The Californian Lot.674 Piqué are true-to-size, with the usual “vanity sizing” standard in the industry. 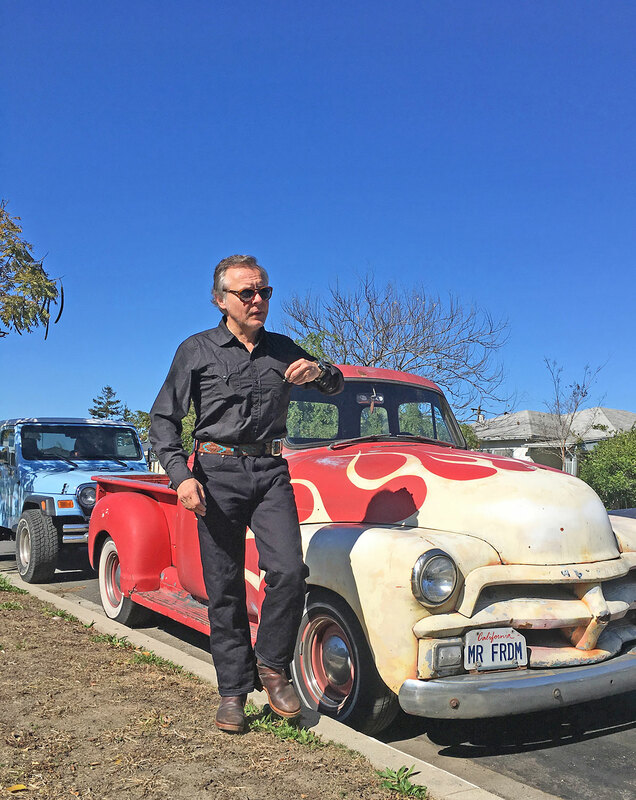 I opted for a W31 in the Lot.674 Californian Piqué, which tends to be my size of choice for the MF® style of 1960’s slim jeans patterns, such as our popular Speedways, Malibu’s, Lot.74 and Lot.674 models. 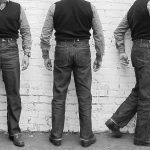 When playing around with period “flood length” à-la McQueen, rather than rolled cuffs or modern unsightly stacking, the Lot.674 has a definite sixties vibe silhouette. 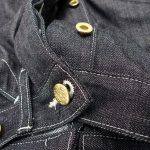 Note that unlike most denim fabrics, this piqué fabric will not stretch with wear. 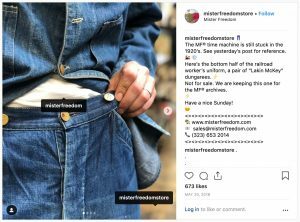 Mister Freedom® “McKARSTEN” Trousers, indigo métis & HBT denim, SS2019 mfsc SURPLUS catalog, made in Japan. 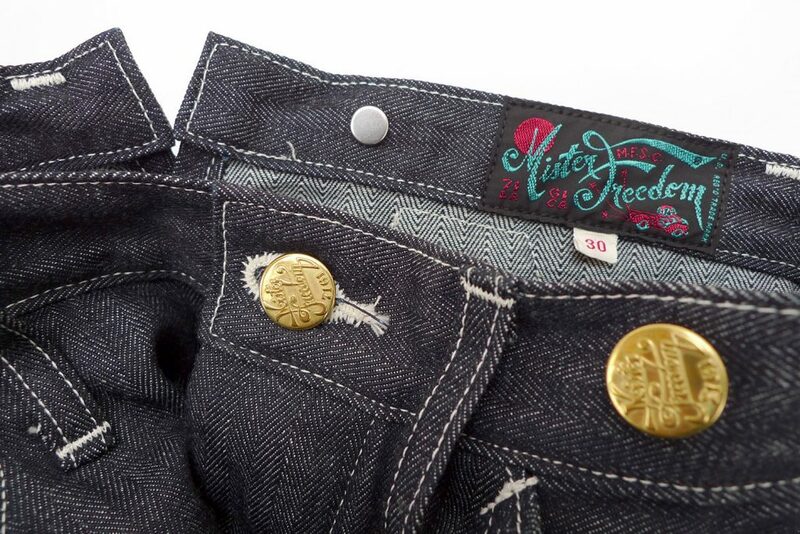 Mister Freedom® “McKARSTEN” Trousers, indigo métis & HBT denim. 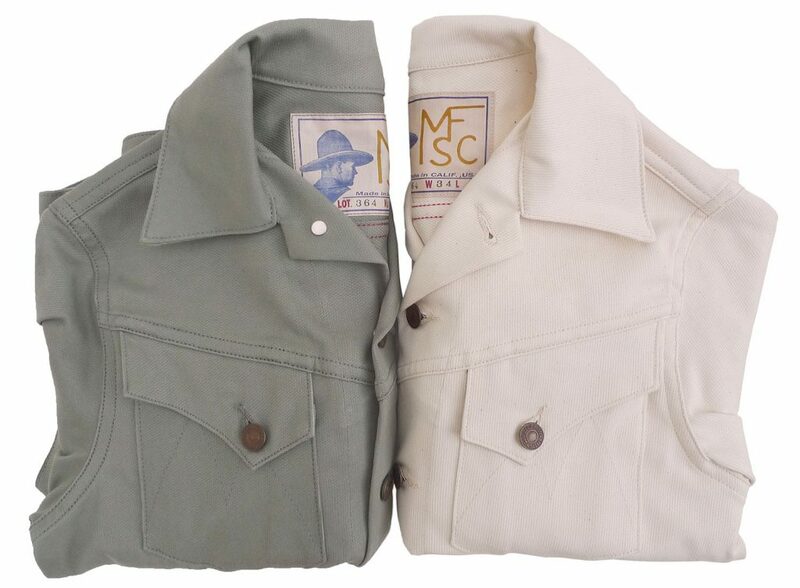 We are adding another set of “might-have-beens” to the Mister Freedom® x Sugar Cane Co mfsc Surplus catalog, our on-going collection of made-in Japan classics á la MF®. 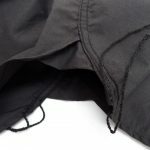 Matching companion to the recently-released McKarsten Jacket, here are the “McKARSTEN” TROUSERS. The vintage garment that inspired our McKarsten Trousers pattern is an original pair of work dungarees produced by “Lakin & McKey” in the 1930’s. 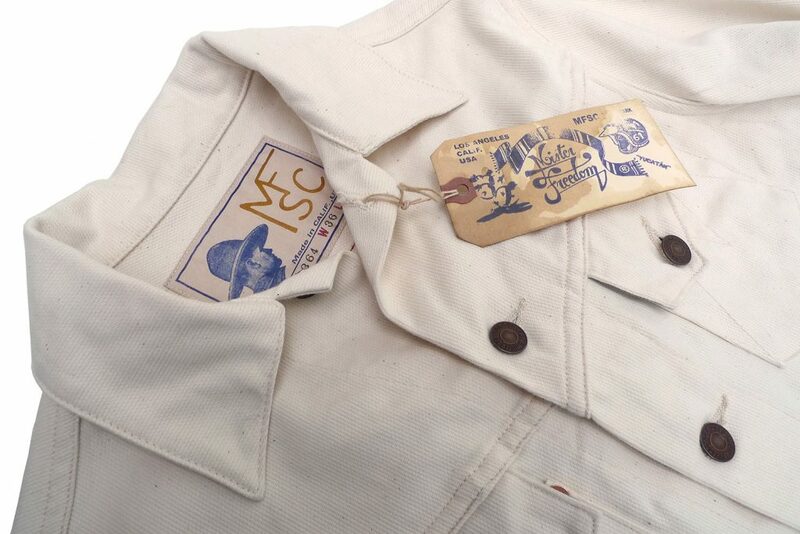 This vintage goodie was purchased by Peter on behalf of the MF® archives. 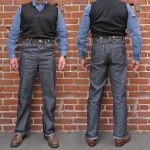 The pants were scored with a 1930’s “Test” jacket, and came as a workwear extravaganza top & bottom denim highly-collectible set. 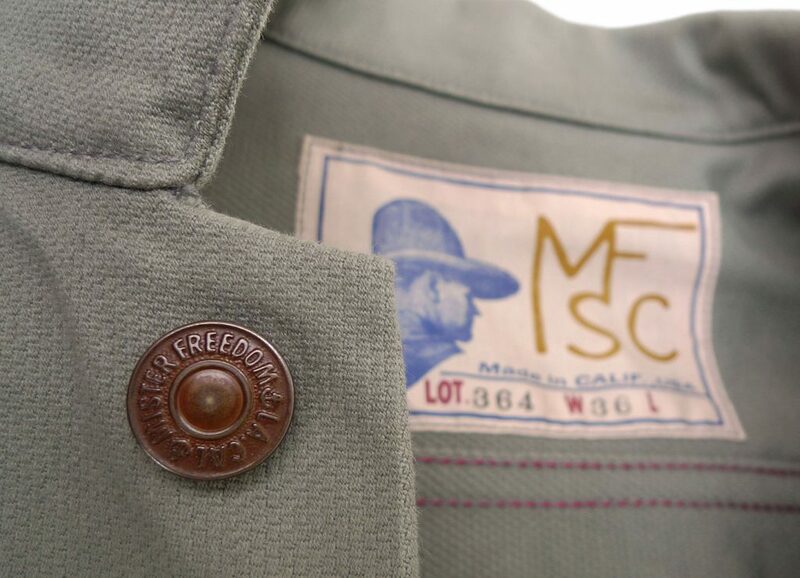 This “suit” initially belonged to a railroad worker, who lived somewhere in the American Midwest… Both of these specimen of workwear history can be seen at the MF® HQ, hanging as rag-hunting trophies amongst other bygone eye candy that inspire us. 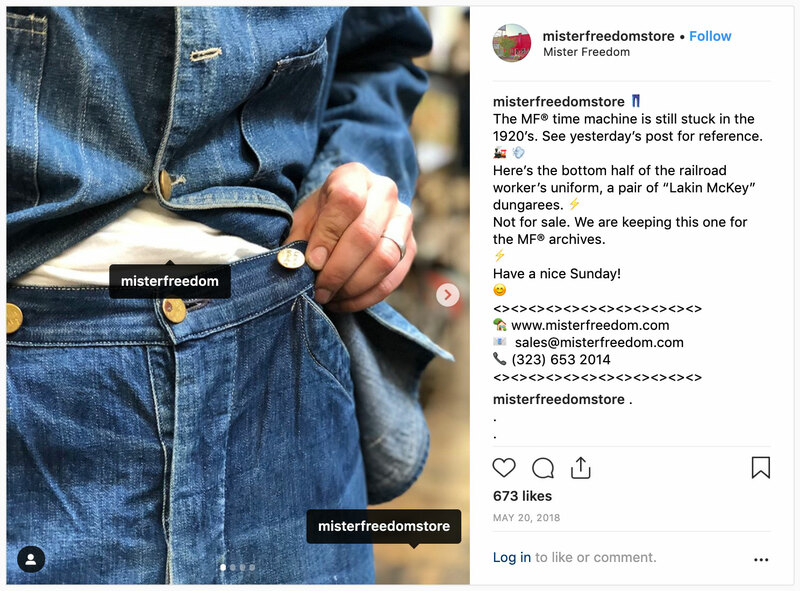 Vintage TEST railroad jacket with Lakin McKey dungarees, courtesy of the outstanding MF® Store IG account. 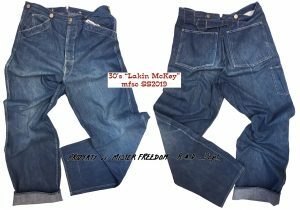 Inevitably, these old denim pants featured a dreadful period fit, even for our “Heritage Style” esthetics. 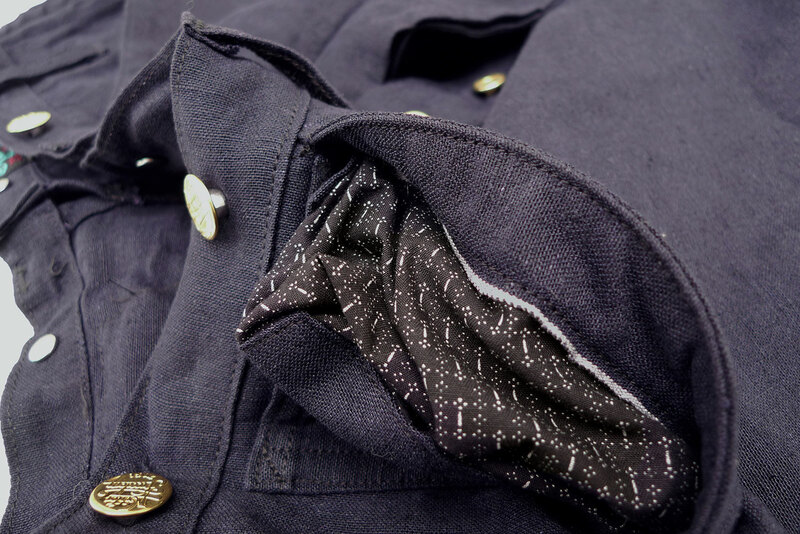 We thoroughly tweaked the pattern and turned them into a contemporary wearable, yet keeping the early workwear full leg-high rise style. 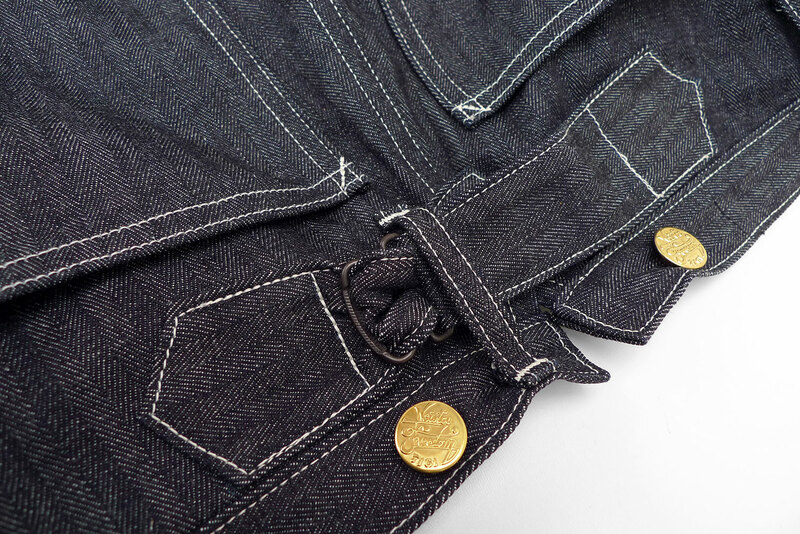 Our interpretation is otherwise fairly literal to the original’s period details: utilitarian dungaree pattern without back yoke, early tailoring split waistband open back gusset, buckle-back, branded tack brass buttons, full top front pockets with fancy stitching, utilitarian “carpenter” style rear patch pockets… We removed the side tool pocket to tone down the contractor vibe. 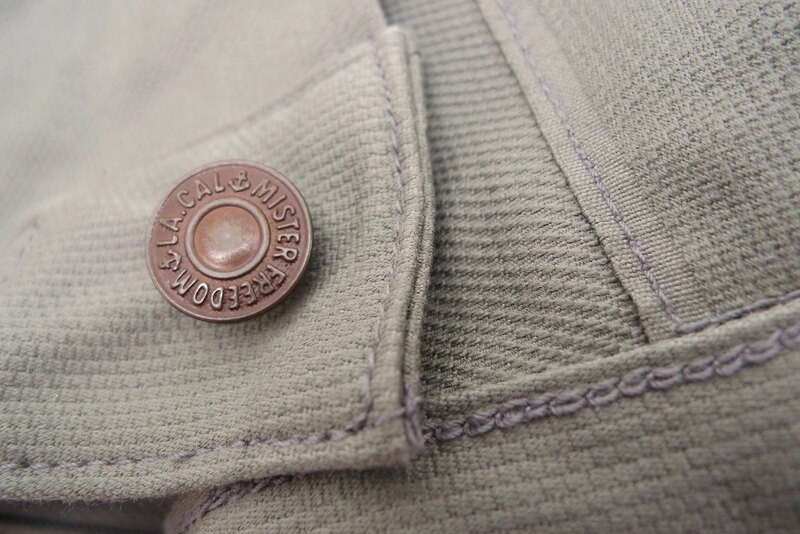 Our trousers’ hardware features fancy mfsc original workwear-style brass tack buttons, a new toy for us this Spring 2019, a design introduced with the McKarsten Jacket. 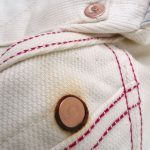 These metal buttons will naturally age and acquire an attractive patina overtime. 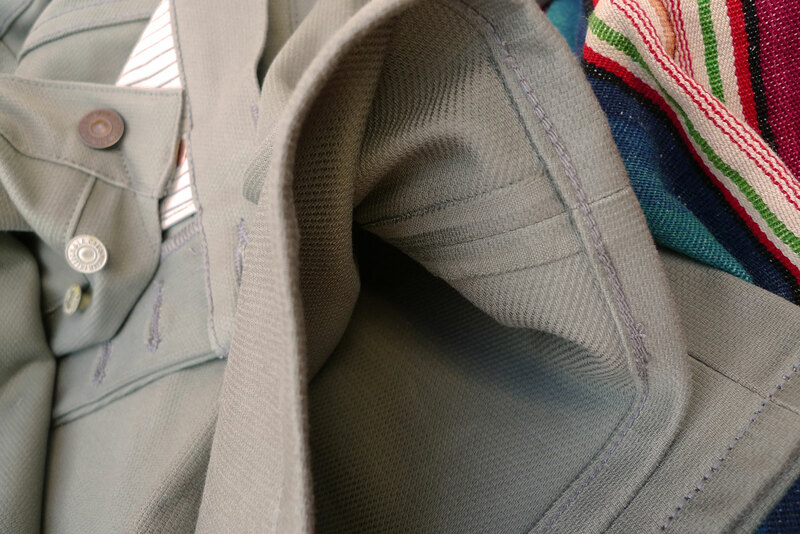 We are releasing the McKartsen Trousers in two distinctive fabrics. The first one is a 10 Oz. 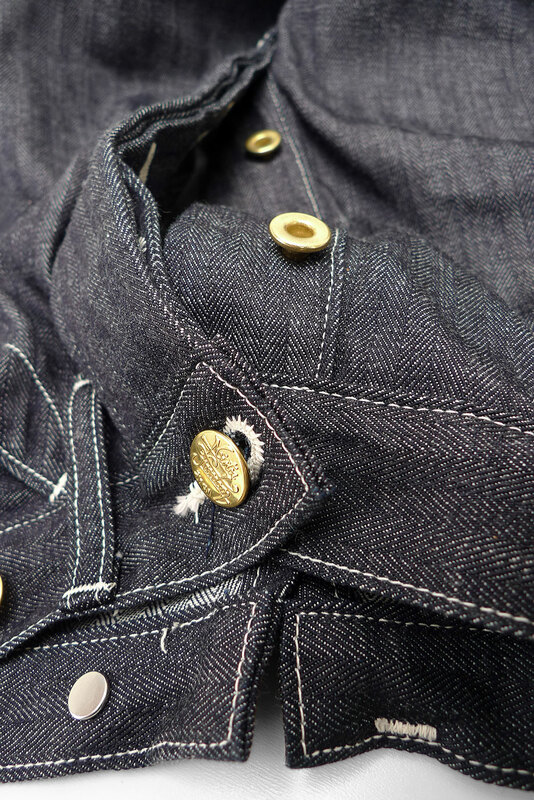 HBT indigo denim. 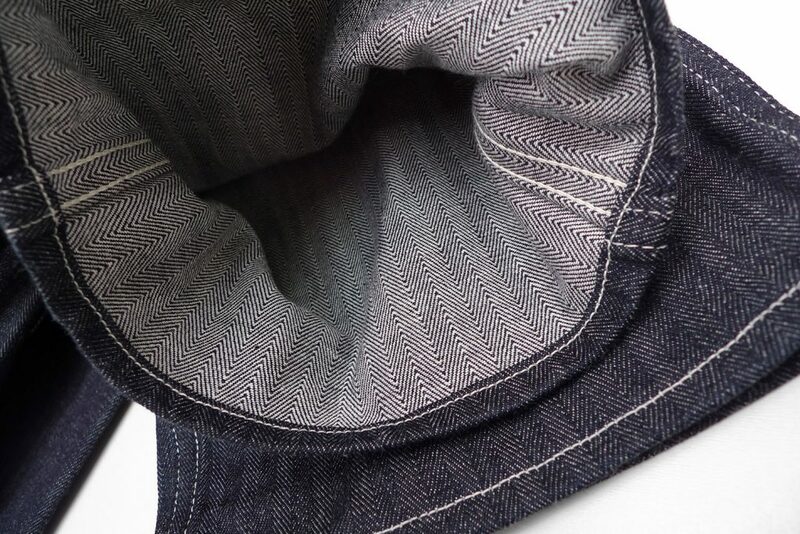 This fabric is what happens when you weave the components of traditional denim fabric (indigo-dyed warp yarns and natural color weft yarns) into an Herringbone Twill (HBT) pattern. 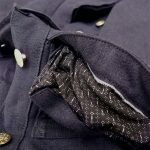 If the fabric face only subtly displays the HBT pattern, the geometric eye-dazzling weave is very obvious on the reverse. The HBT pattern should yield interesting fading specifics. 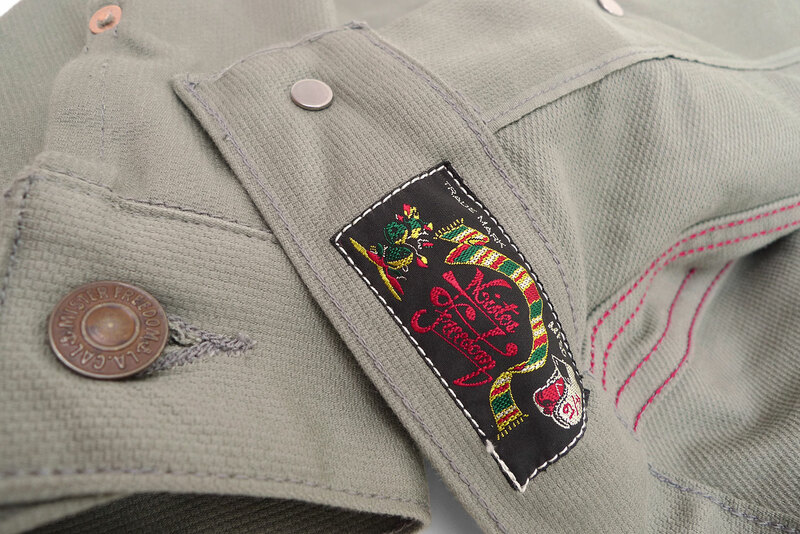 For the Jailhouse Rock look, we opted for contrast stitching on this fabric. 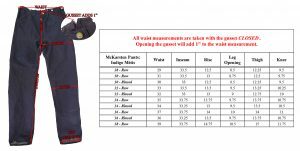 The second fabric option is a 7 Oz. 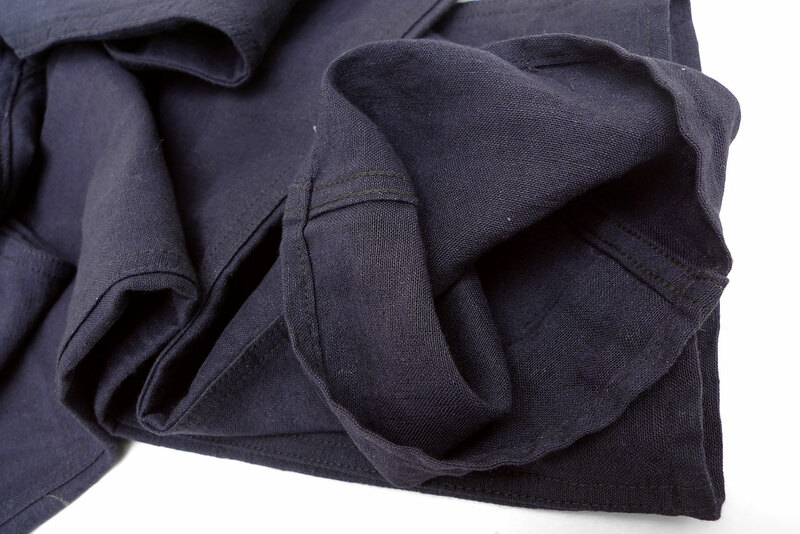 blend of 75% linen and 25% cotton (referred to as métis in French), plain weave, indigo and black yarns. 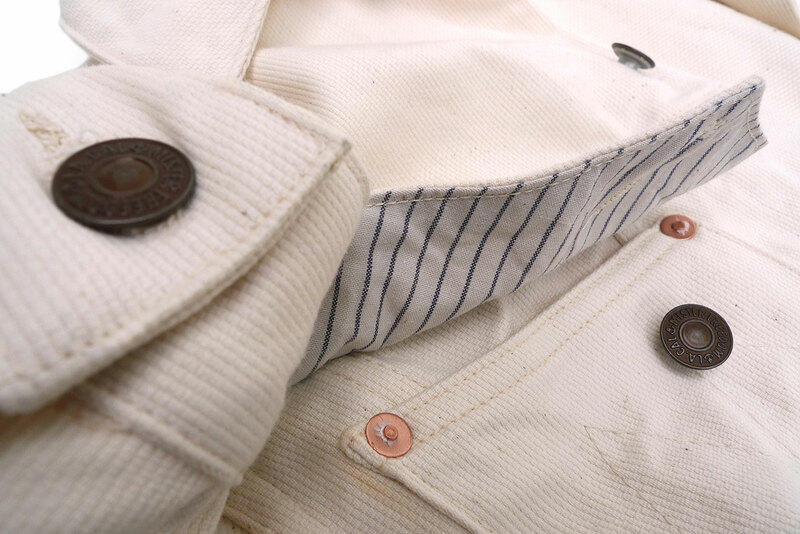 This fabric was inspired by a 1920’s pair of French work pants, and milled with similar specs. 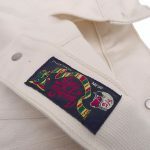 Our version is very “breathy” and not tightly-woven, making it a great summer-weight fabric, with a somewhat see-through quality not uncommon on vintage tropical garb. 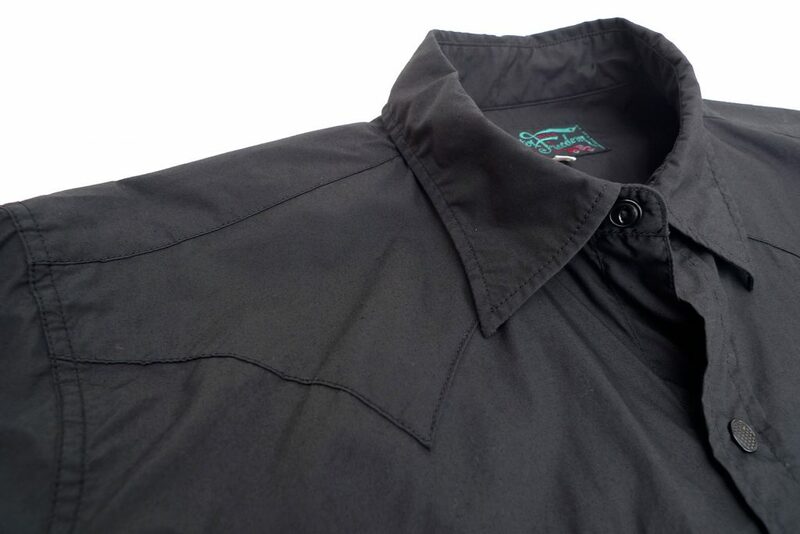 Tonal stitching conveys elegance making this option less workwear-ish. 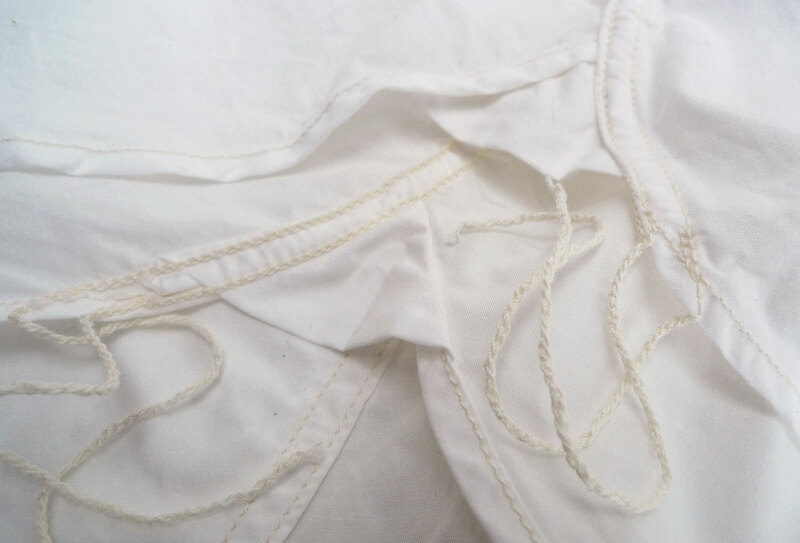 The fabric drape and wrinkly dry hand is typical of high-content linen métis. 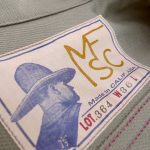 The mfsc “McKARSTEN” TROUSERS are designed in California by Mister Freedom® and manufactured in Japan by Sugar Cane Co.
Pocket bags: cut from mfsc double-sided calico print twills, “NOS” from the Trade Shirt and Nixon Shirt. 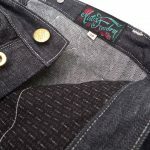 * An original mfsc pattern, inspired by 1920’s-1940’s work dungarees. * Vintage 1930’s silhouette, full leg/trim high waisted top block. 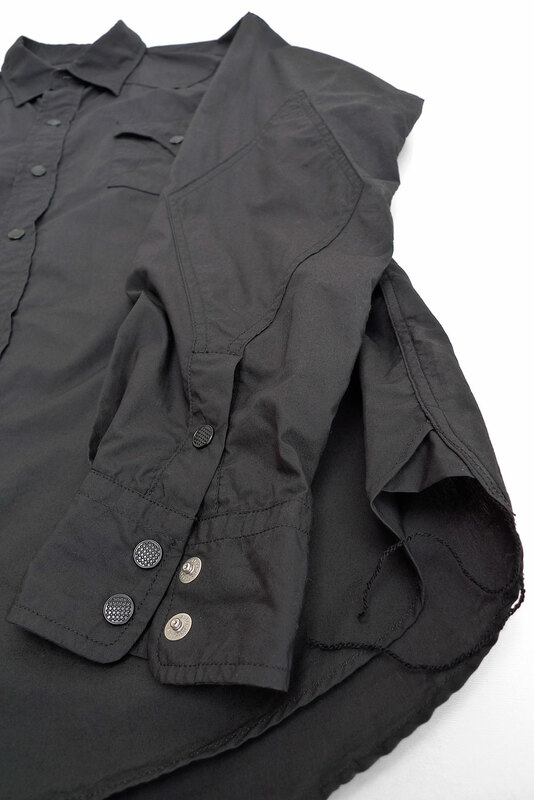 * Early tailoring split waistband, open back gusset. 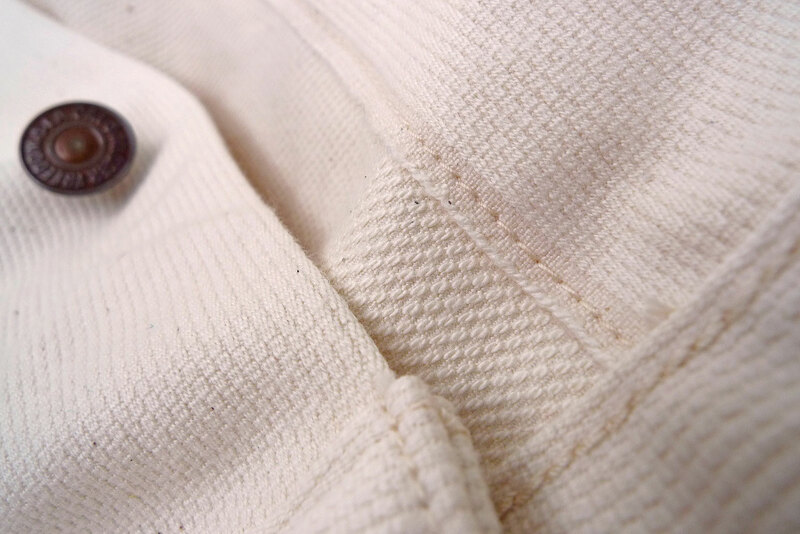 * Cinch back, no back yoke pattern. 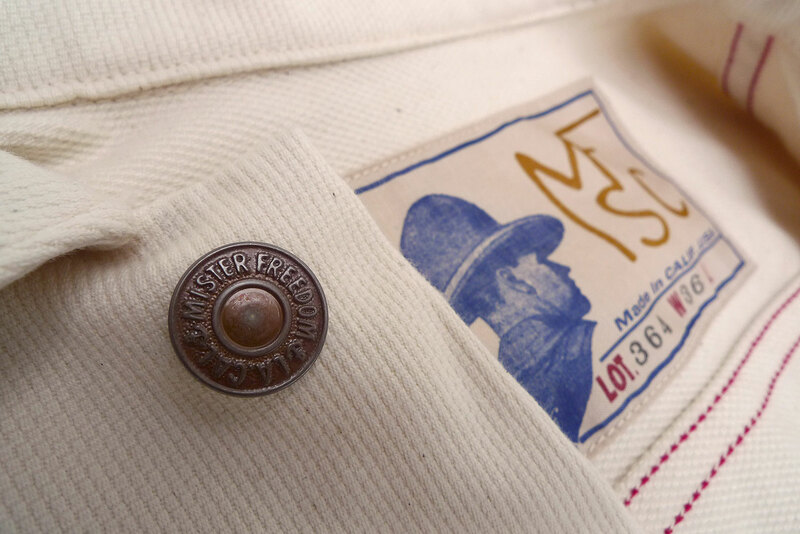 * MF® mfsc branded tack brass buttons. 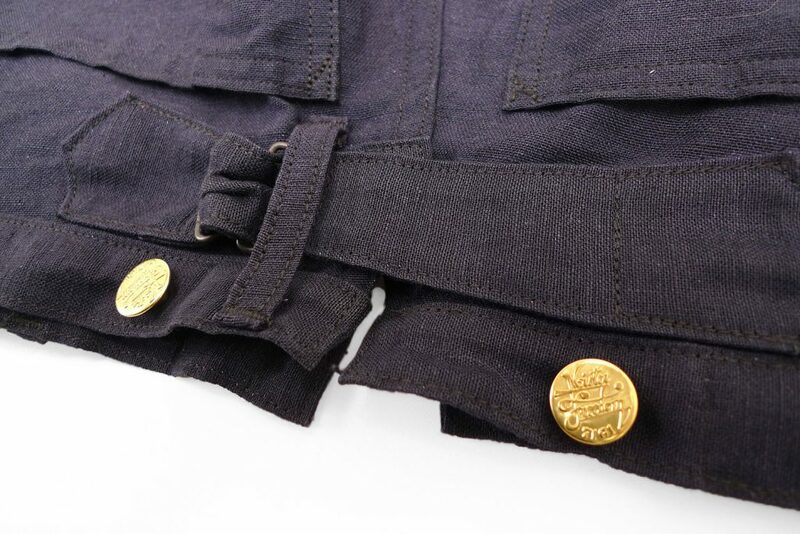 * Utilitarian “carpenter” style rear patch pockets. 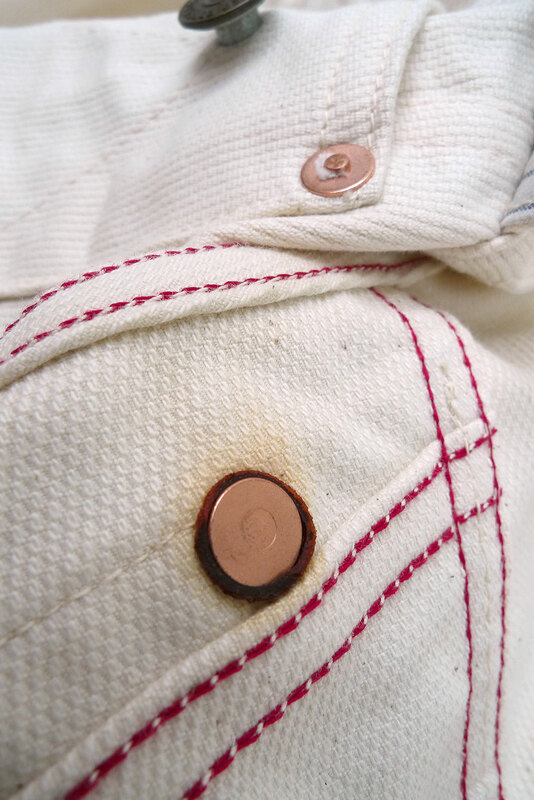 * Brass donut fly buttons. 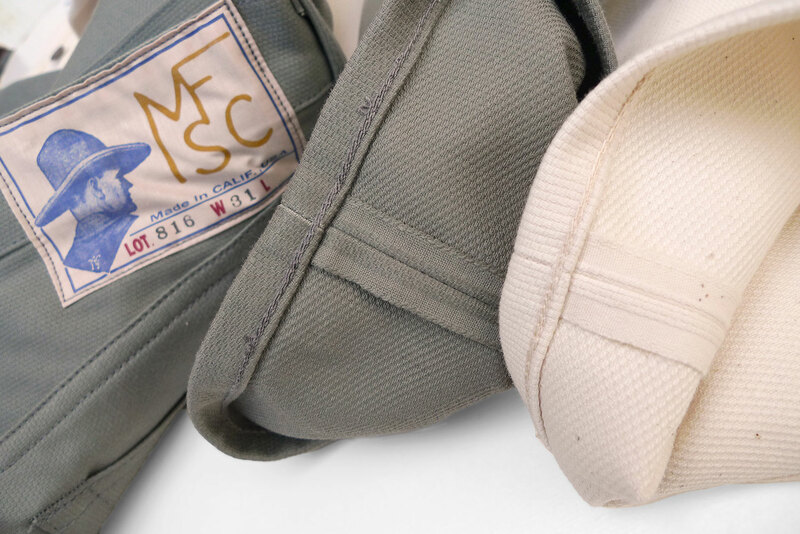 * Pocket bags cut from mfsc “NOS” double-sided calico print twills. 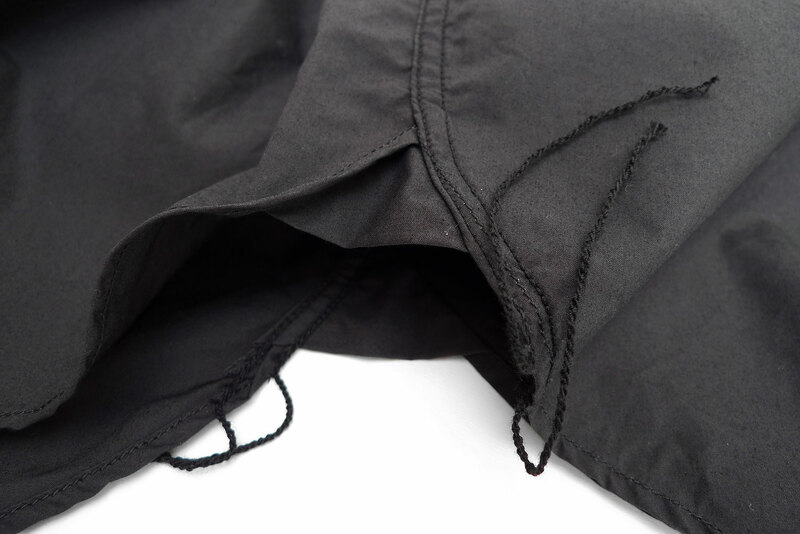 * Felled seam leg chainstitch construction. 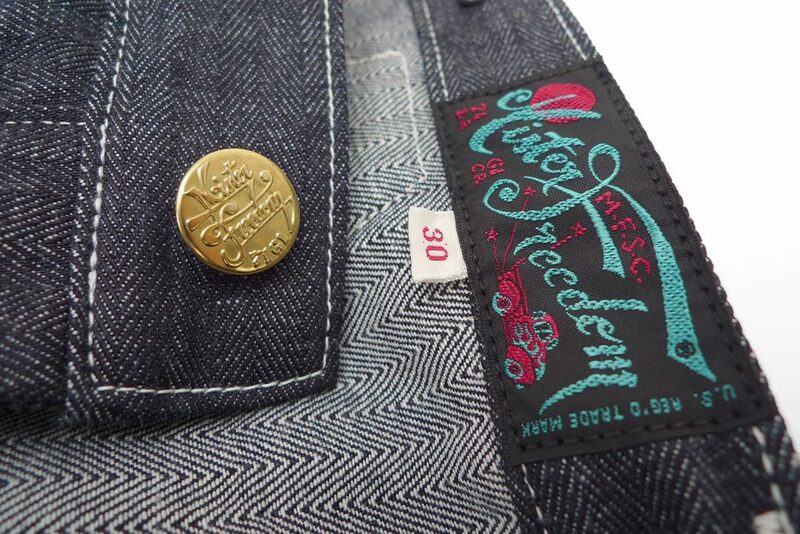 * Single needle bottom hem. Although the drape of each fabric is very distinct, both fit the same, and the same sizing advice applies to HBT denim and indigo métis. 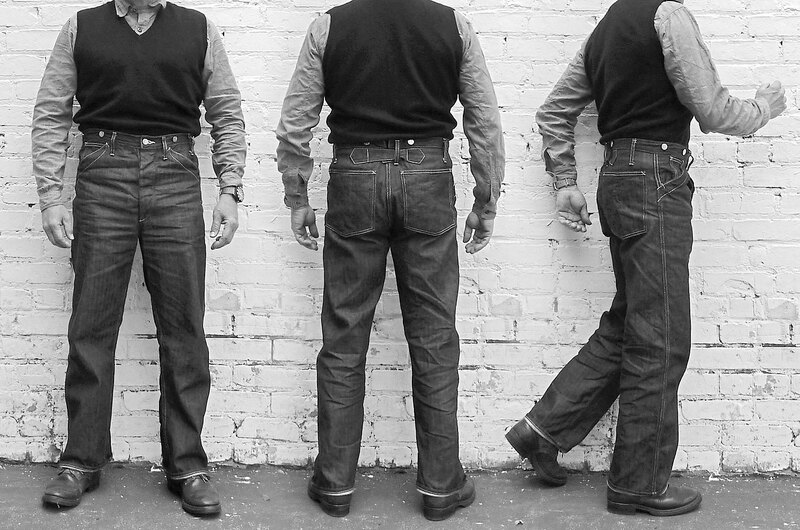 Our target image was a vintage 1930’s silhouette, full leg/trim high waisted top block. 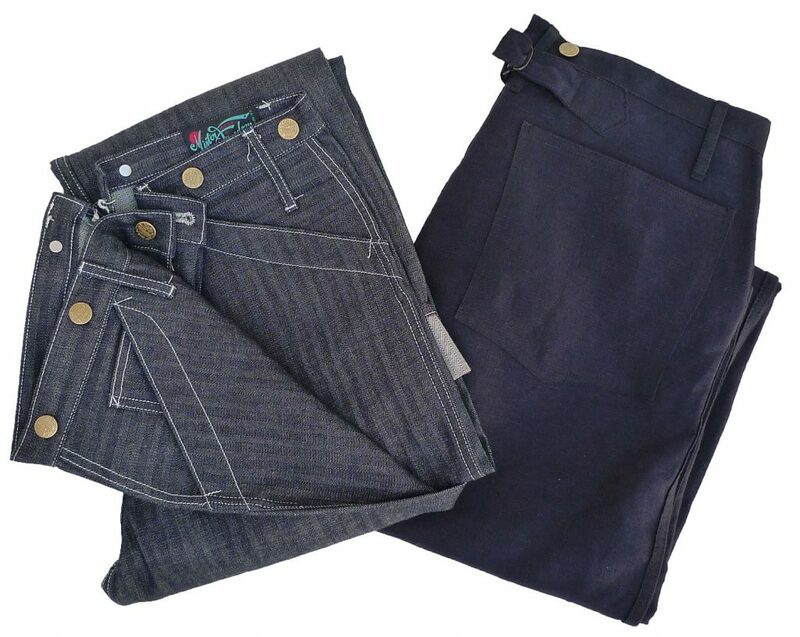 These trousers feature a wide leg and high rise, an acquired taste by today’s menswear fashion standards. 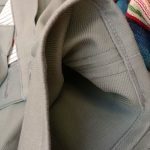 Due to the split-waistband pattern, the waist is quite generous and the open gusset allows about one inch play. 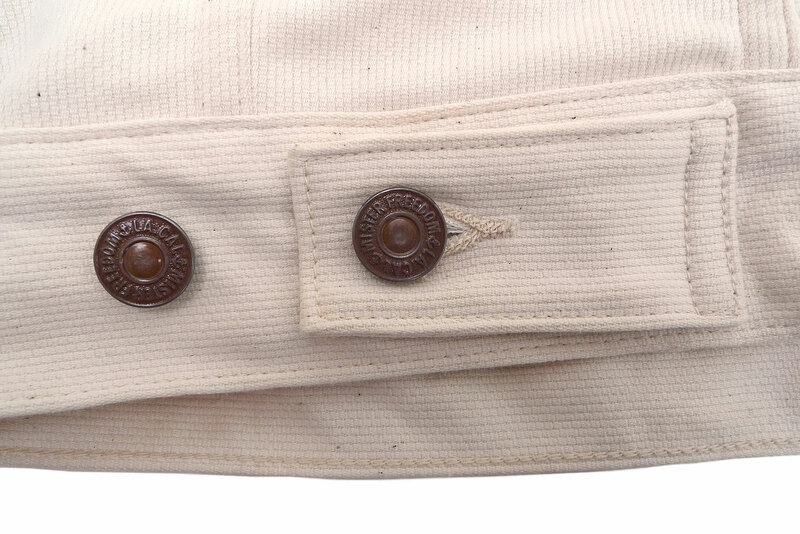 I could fit a snug Waist 30 but opted for a very comfortable Waist 32, and cinched the waist with the back strap. 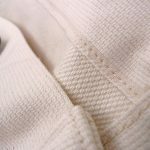 The original bottom hem is single needle, an easy alteration, with enough length to accommodate all types of cuffing preferences for most. 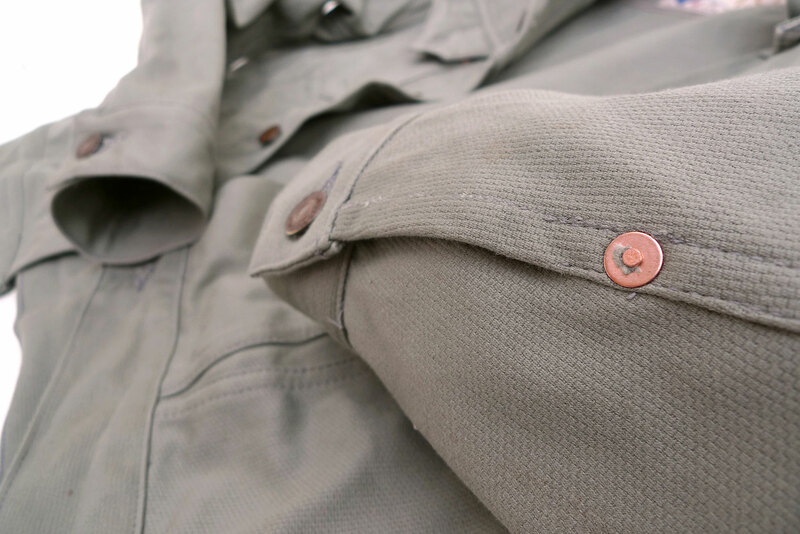 When needed, machine wash the MF® McKARSTEN Trousers on DELICATE, cold water, mild eco-friendly detergent. Hang dry. 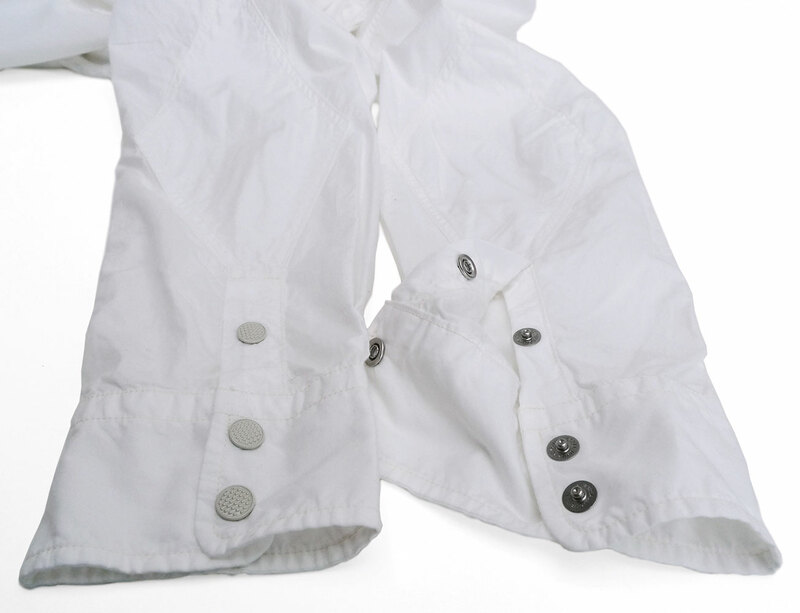 Wash separately to avoid color transfer to light-color garments. 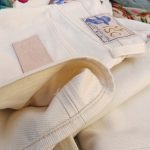 Turn the pants inside-out to avoid potential marbling of the indigo fabric. 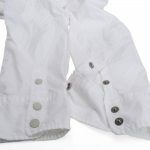 Using hot water wash will result in unnecessary color loss and excessive shrinkage. 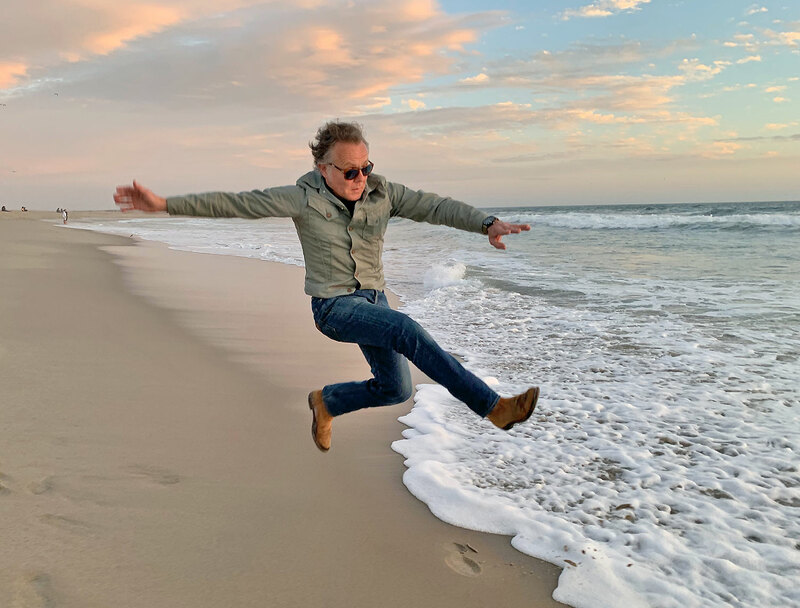 April 8th, 2019 | Enter your password to view comments. 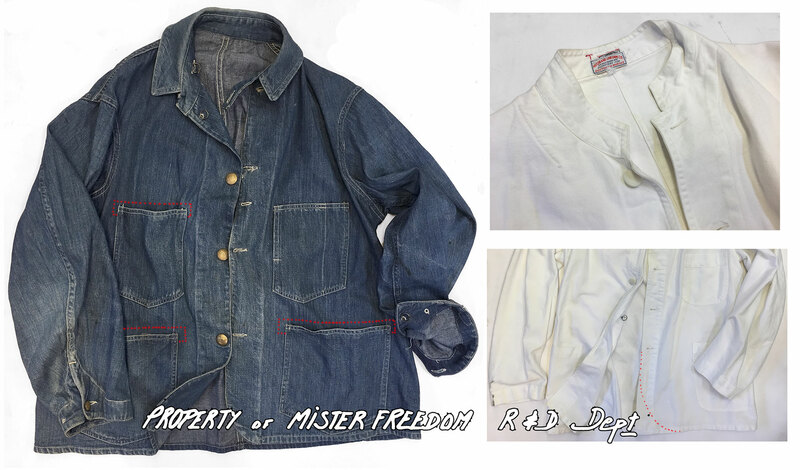 Mister Freedom® “DUDE RANCHER” western snap shirt, cotton broadcloth, SS2019 mfsc Surplus catalog, made in Japan. 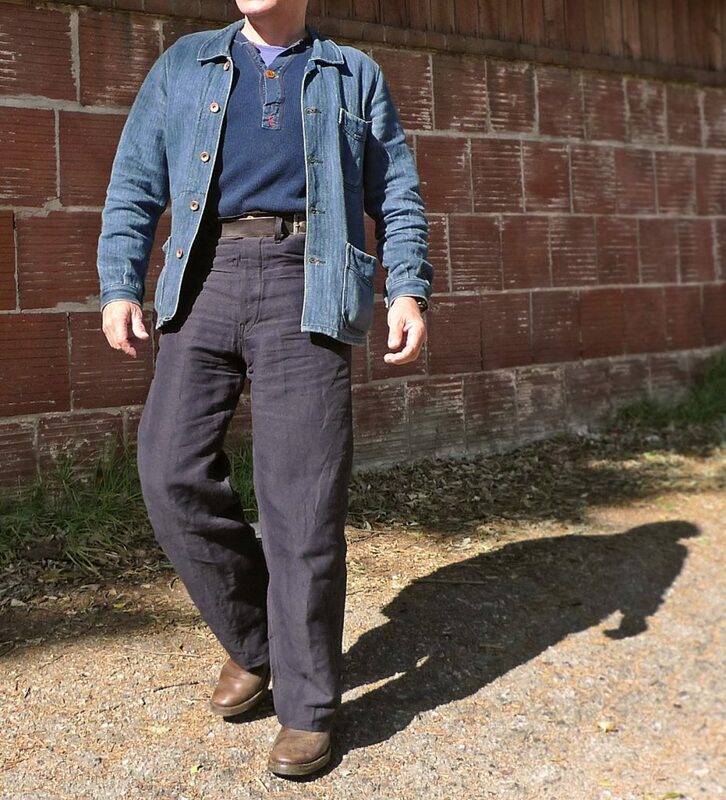 Following the Mister Freedom® Appaloosa introduced during Fall 2013 and released in a variety of denim-related fabrics, the “DUDE RANCHER” is our second traditional “western snap” shirt. 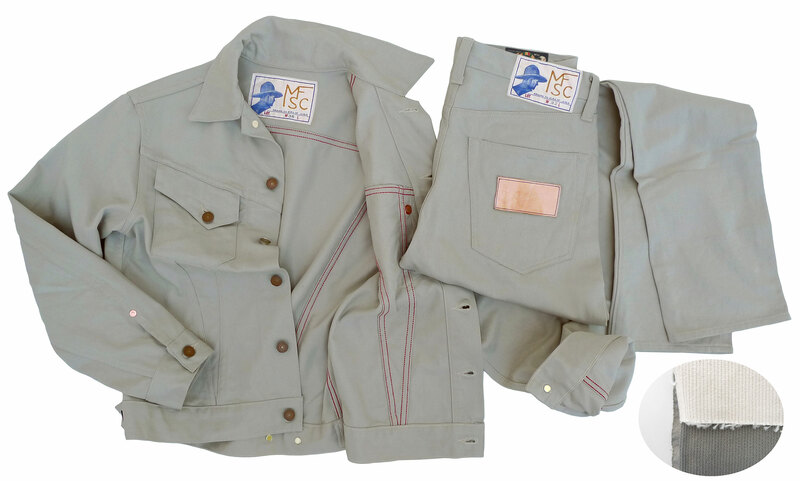 This all-original pattern was inspired by a selection of vintage “cowboy” shirts, and will now be joining the ranks of the mfsc SURPLUS catalog. 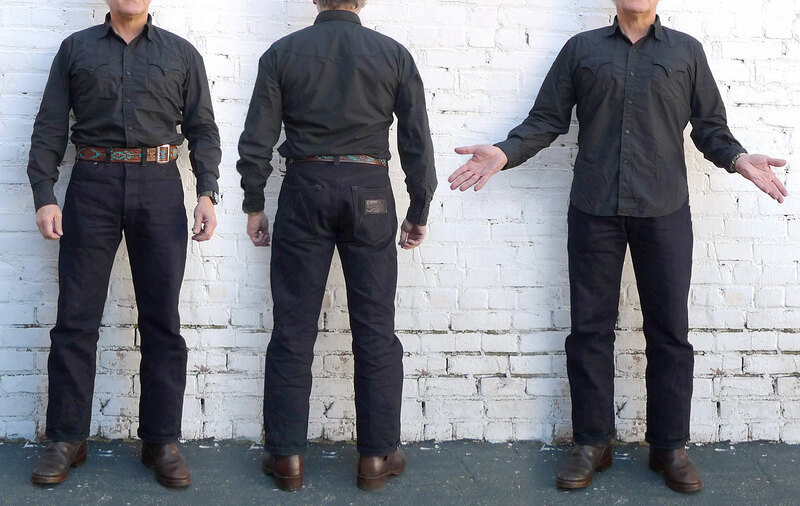 The DUDE RANCHER features the expected western-style front and back yokes. 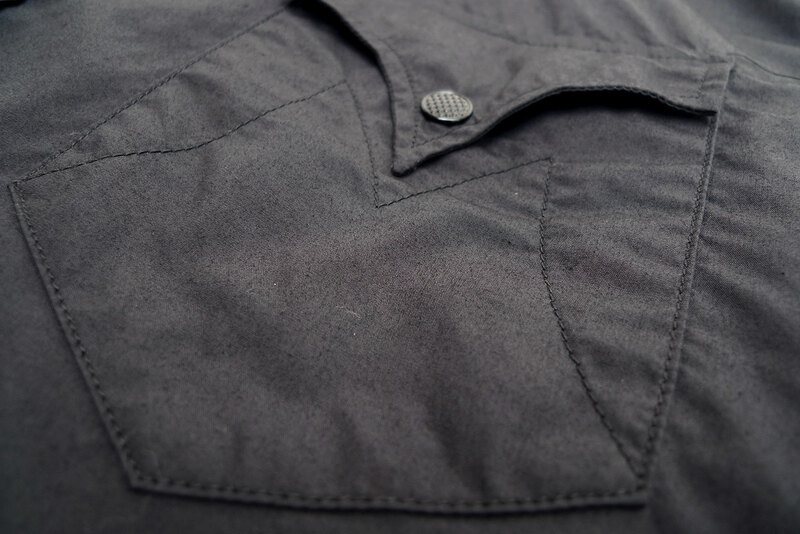 We opted for arcuate panels subtle-enough to keep the shirt as a daily-wearable, with traditional yet understated curved yokes. The playful “M” tonal branding stitch on the chest pockets is also discreet. 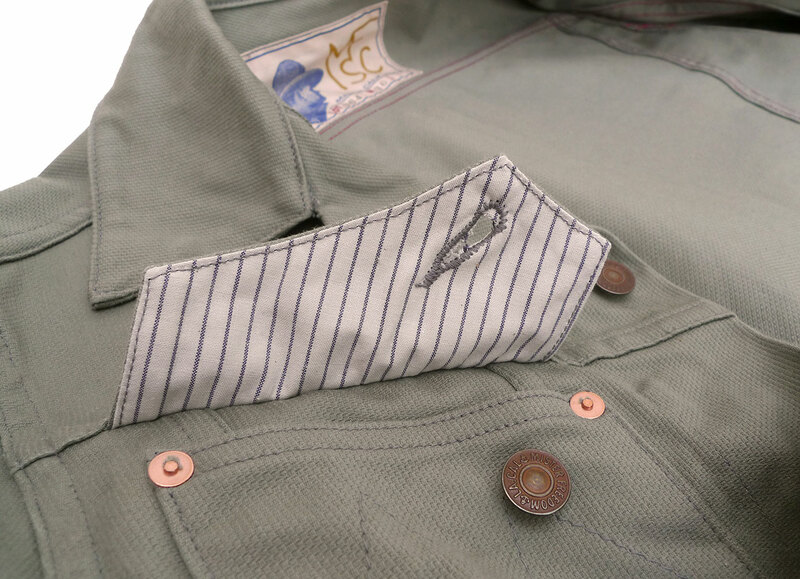 We couldn’t help an ace up the sleeve with the tricked-out forearm pattern featuring an intricate one-piece elbow/cuff reinforcement diamond-shaped placket. 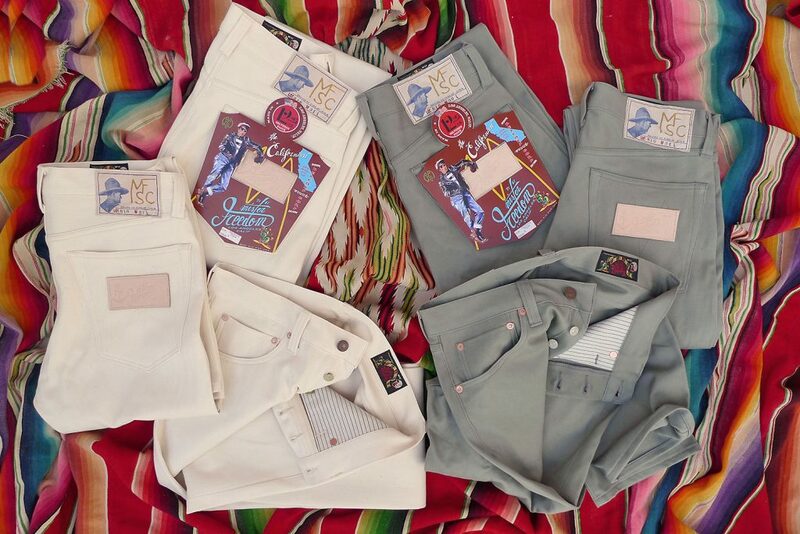 The pattern-making connoisseur will appreciate. 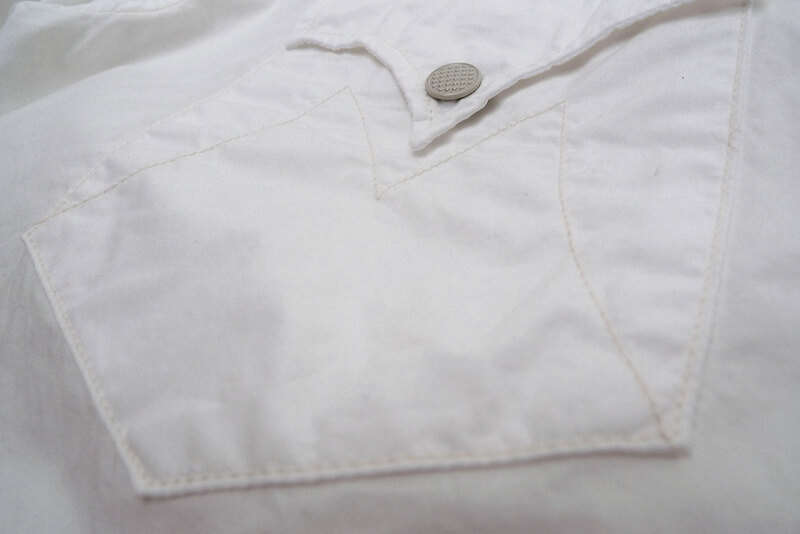 The fabric we opted for for this first release is a fancy 100% cotton broadcloth, a type of tightly-woven poplin. 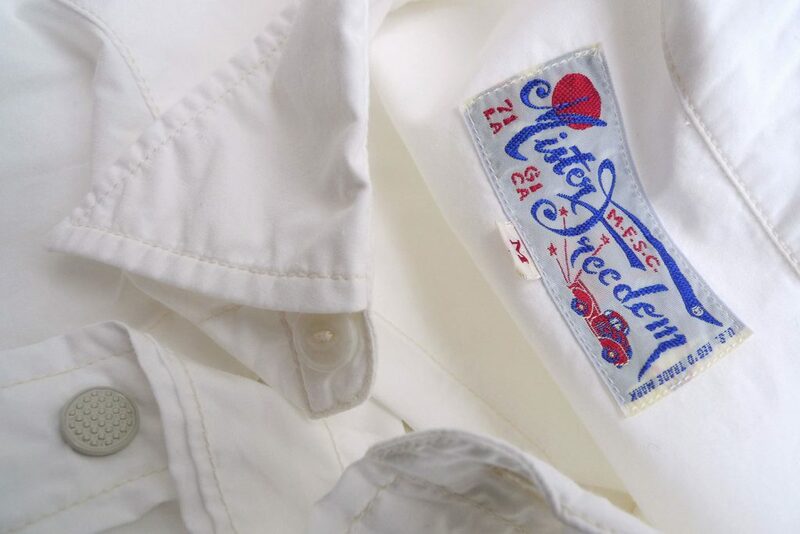 Broadcloth, with its silky smooth surface and crispy dry hand, is often associated with fancy vintage dress shirts. 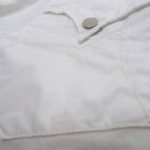 As a caveat, cotton broadcloth is prone to natural fabric wrinkling, a characteristic of garments cut from noble natural fiber materials (cotton, linen, silk etc…), before the crowning of poly-cotton and acrylics as households’ favorites, sometime in the 1960’s, to facilitate stain removal and liberate one from the burden of ironing. 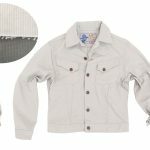 Generations later, this fashion shift and material preference will also lead to the production of billions of pounds of synthetic garments impossible to recycle. As introduced a few years back with the Sportsman printed flannel Camp Shirts, the DUDE RANCHER features painted metal snaps, reminiscent of 50’s Ranchcraft or Blue Bell shirts. 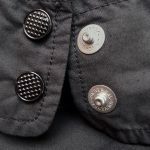 If pearl snap buttons are more-commonly associated with traditional western shirts, our use of tonal metal snaps is both a nod to bygone westernwear fashion, and a design choice for a toned-down vibe that doesn’t scream yipikaye. 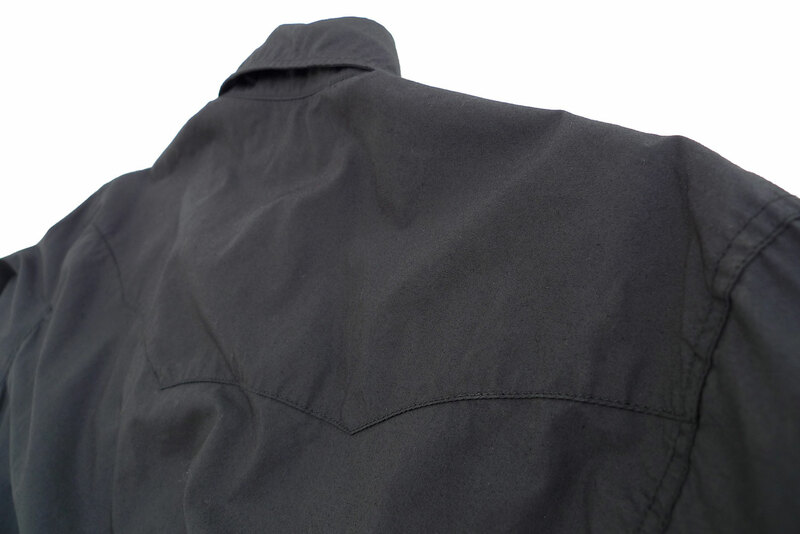 Basically, we wanted an easy-to-wear classic garment. 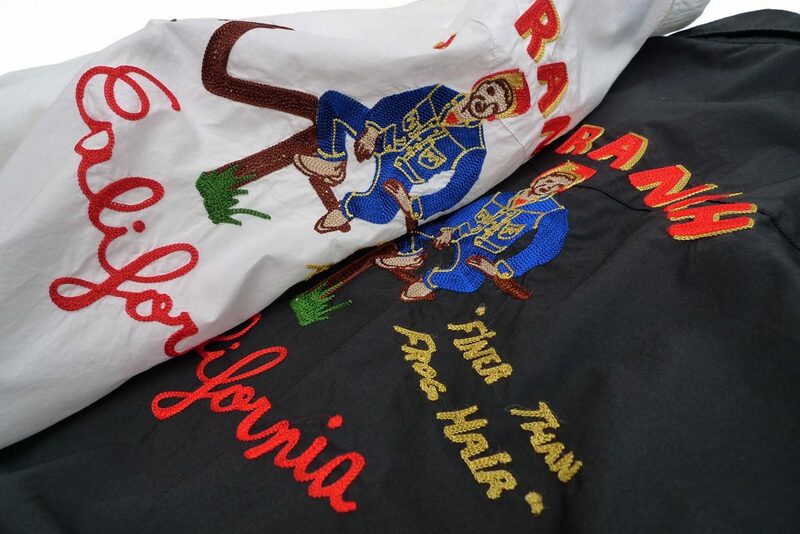 For the rodeo-inclined, we are also releasing a limited edition run of embroidered DUDE RANCHER shirts, featuring original chainstitched “MF® Ranch”classic artwork, a nod to 1950’s style of branding work uniforms and other promotional garments. 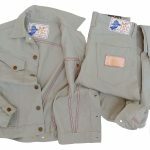 For consistency and cost issues, these custom shirts have not been decorated on hand-crank operated chainstitch machines, but with program-operated machines. 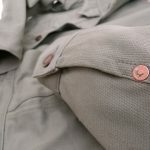 The results are similar, but the expert chainstitch artist will notice the difference in the filling technique. 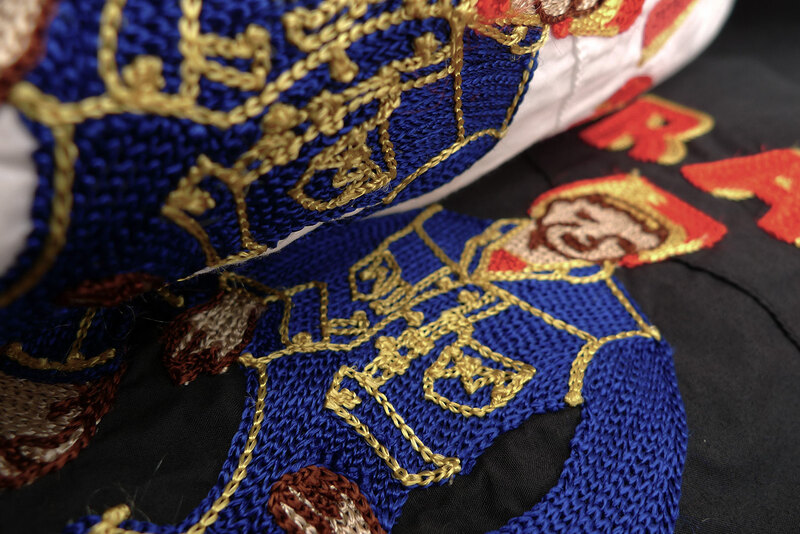 Having recently added a 1950’s Cornely to our upstairs atelier in order to do a few in-house embro jobs, we were quite happy to delegate this tedious custom “rodeo” production task to the pros! 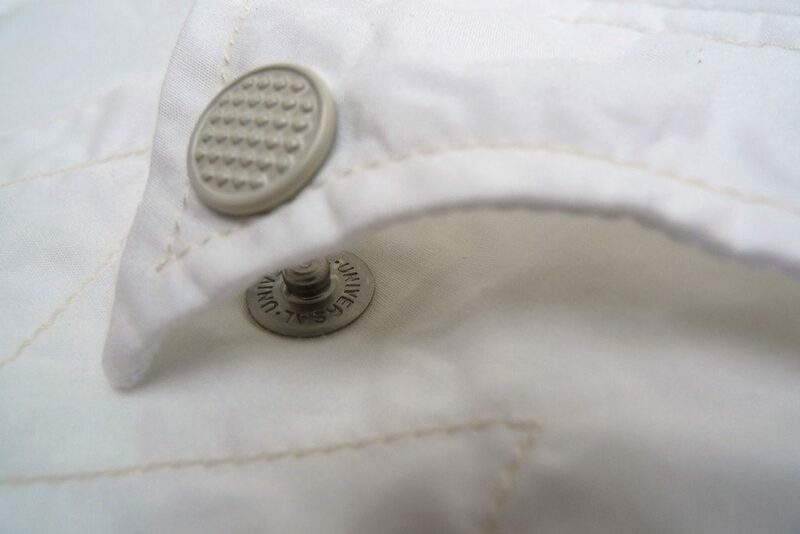 Note: Considering the fine broadcloth fabric and metal snaps, refrain from yanking on the front panels á la Tom Jones when taking your shirt off. 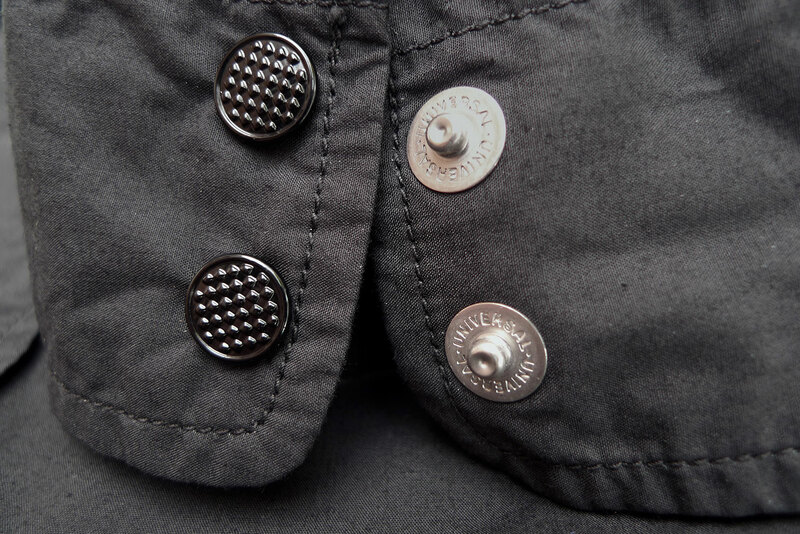 Carefully un-snap the buttons one by one, and listen to the crowd roar. 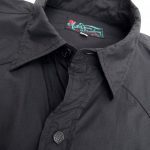 Two color options, black or white. 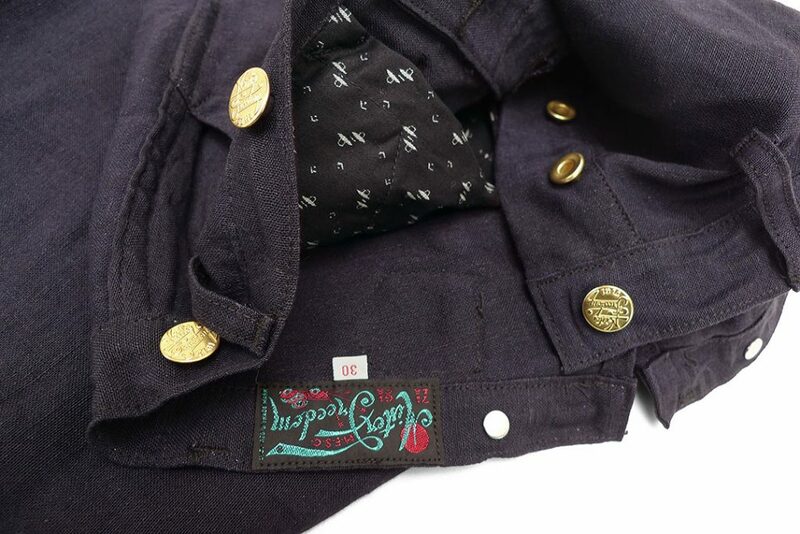 Mind the fine broadcloth fabric and metal snaps combination, and do not use the washer’s heavy-duty cycle. 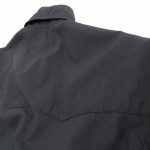 Heat dryer is also not recommended and could damage the garment. 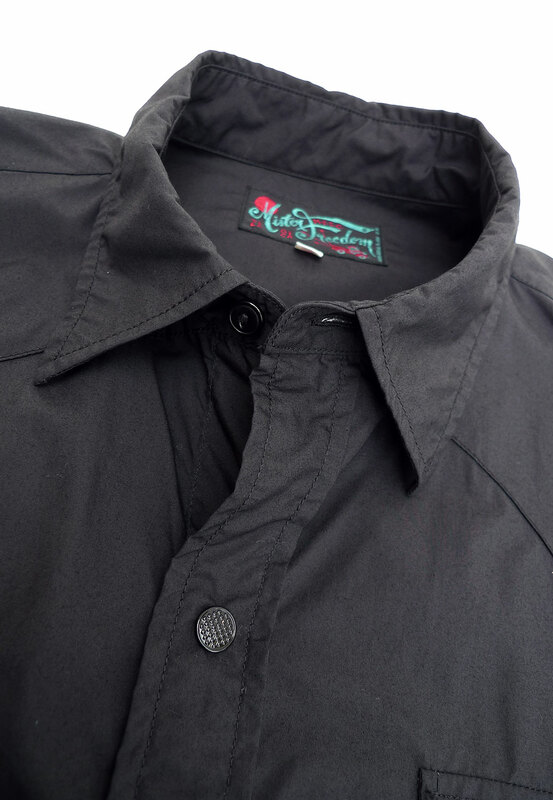 Solid black/white, or “Rodeo Edition”.